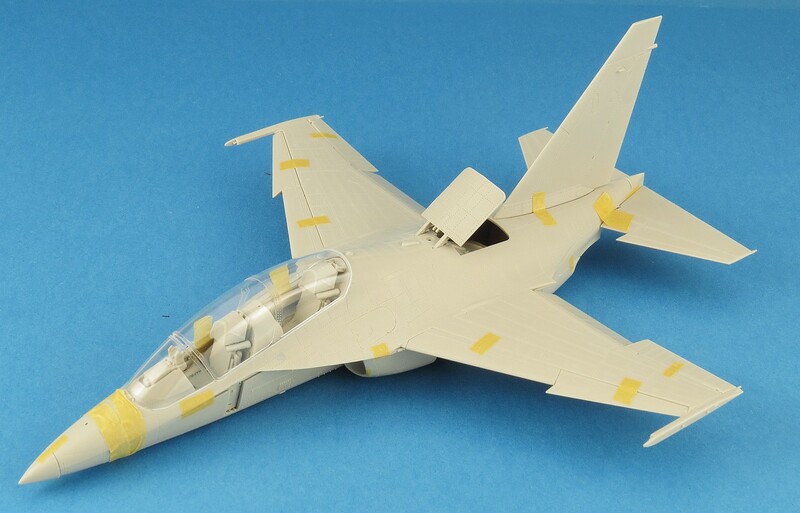 The Modelling News: Dry Fit Review: 1/48th scale Yakovlev Yak-130 'Mitten' from Kittyhawk. 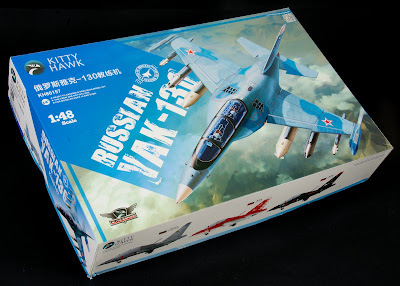 Dry Fit Review: 1/48th scale Yakovlev Yak-130 'Mitten' from Kittyhawk. 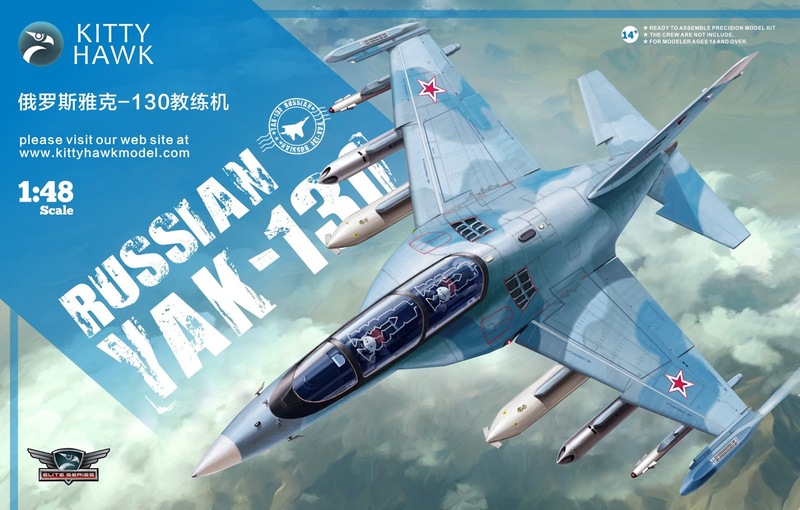 Recently when the Kittyhawk 1/48th scale Yakovlev Yak-130 'Mitten' arrived we thought who better to tell us just what the kit is like than our man Gary Wickham. 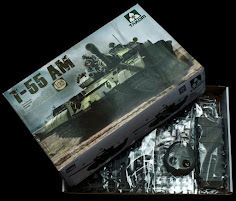 He has a brilliant way of reviewing kits that acts as a construction guide as well as an informed opinion on the parts inside the box and how they go together. 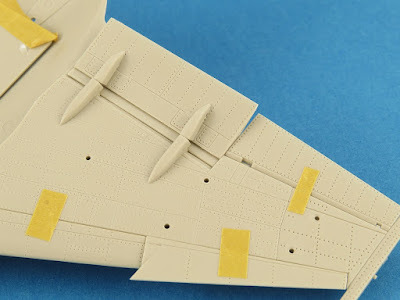 See what he thinks about this latest Kittyhawk new tooled kit in his review. 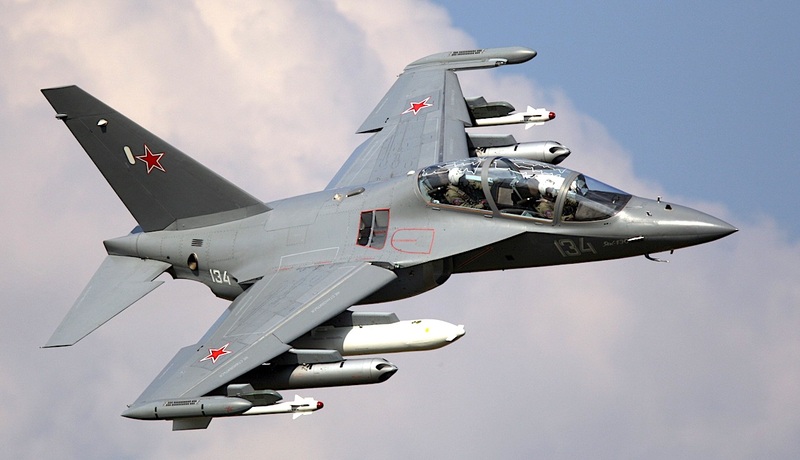 The Yakovlev Yak-130 (NATO reporting name: Mitten) is a subsonic two-seat advanced jet trainer and light fighter originally developed by Yakovlev and Aermacchi. 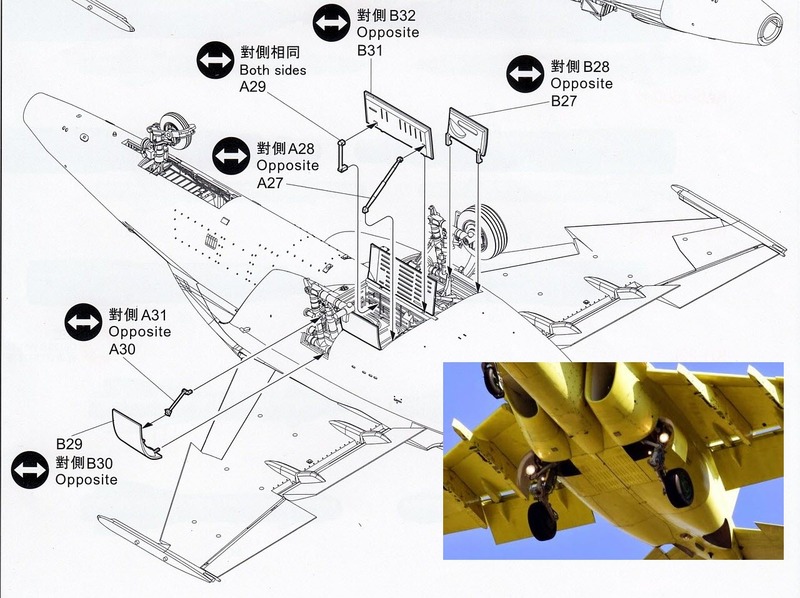 In 2000, differences in priorities between the two firms brought about an end to the partnership, with each deciding to develop the aircraft independently. 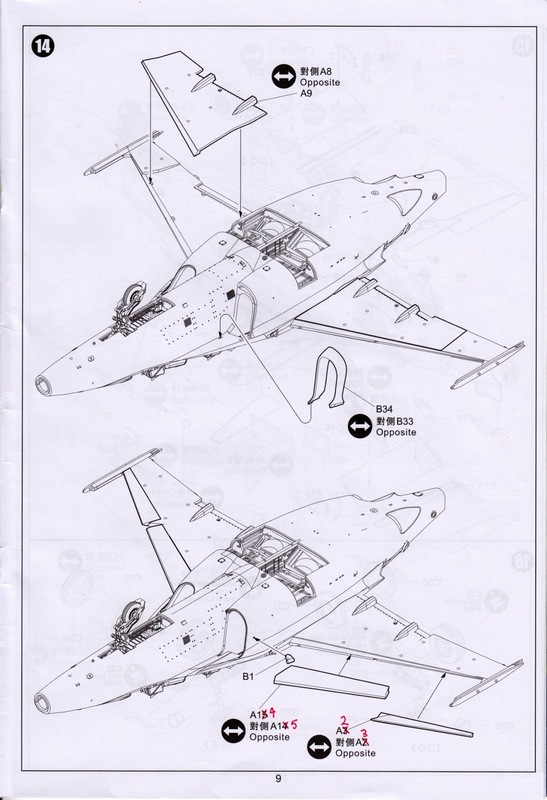 The Italian version was named M-346 Master. 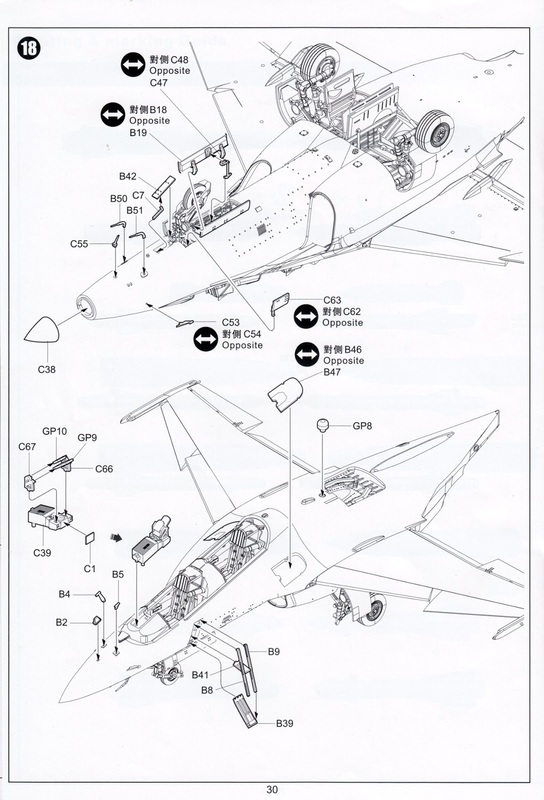 Yakovlev would be able to sell the aircraft to countries such as those in the Commonwealth of Independent States, India, Slovakia and Algeria whilst Aermacchi would be able to sell to NATO countries, among others. 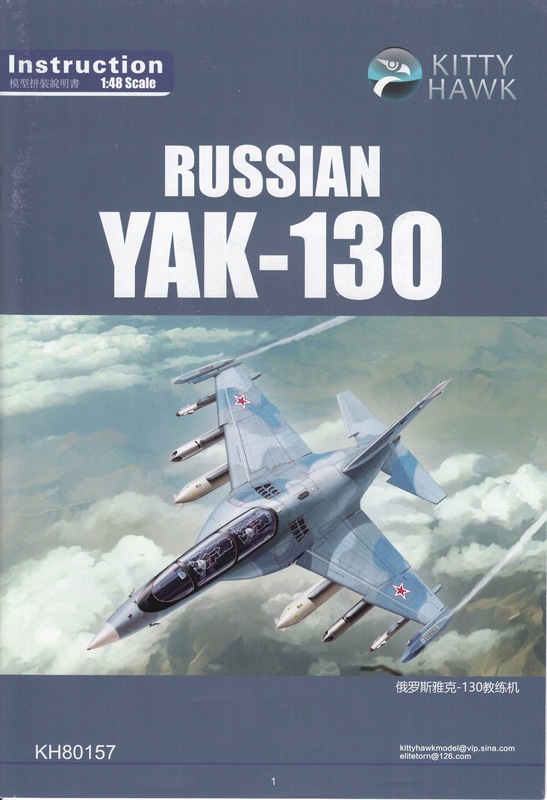 In 2002, the Yak 130 won a Russian government tender for training aircraft and in 2009 the aircraft entered service with the Russian Air Force. 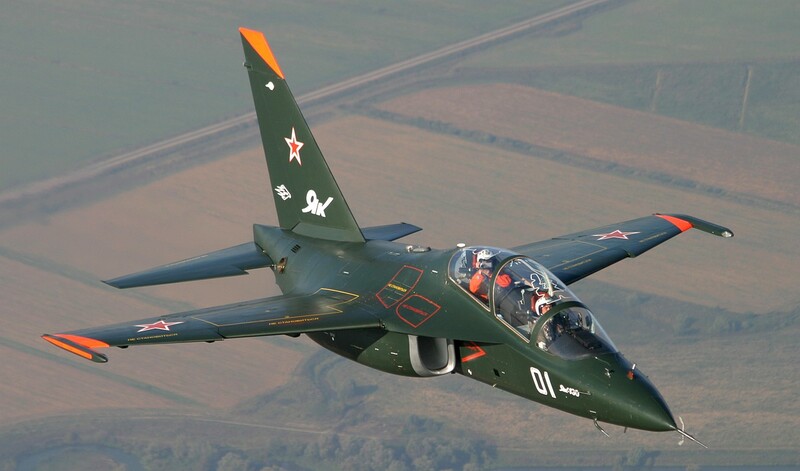 As an advanced training aircraft, the Yak-130 is able to replicate the characteristics of several 4+ generation fighters as well as the fifth-generation Sukhoi Su-57. Algeria - Algerian Air Force – 16 aircraft in service. 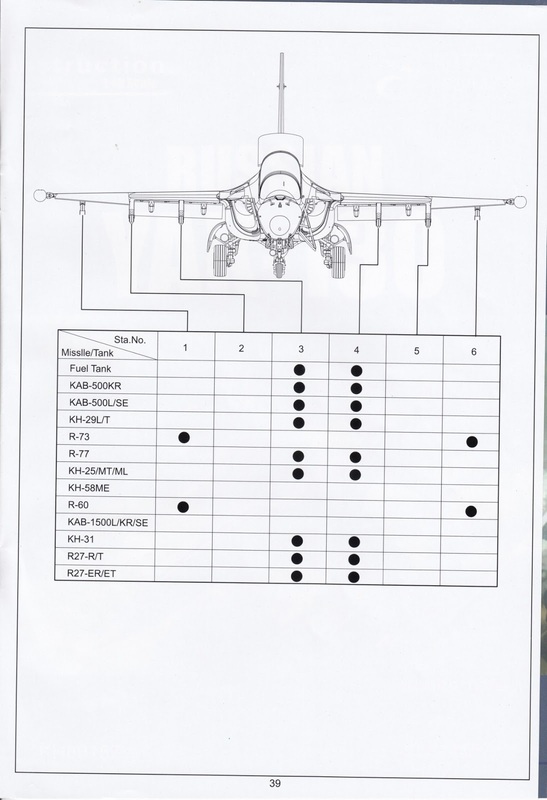 Bangladesh - Bangladesh Air Force – 16 aircraft in service. Belarus - Belorussian Air Force – 8 aircraft in service. 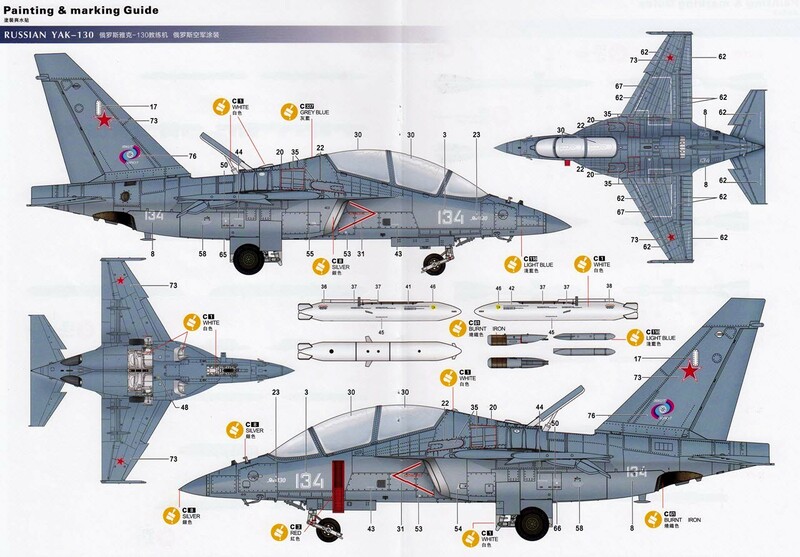 Myanmar - Myanmar Air Force – 6 aircraft in service. In February 2018, it was announced Myanmar will receive another batch of 6 aircraft under the second contract signed in December 2016, the aircraft should be delivered in 2018. 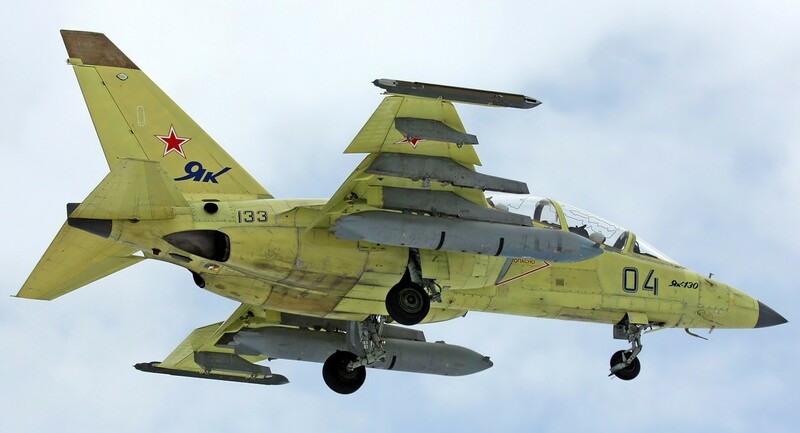 Russia - Russian Air Force – 105 aircraft out of 109 delivered in service as of October 2018. 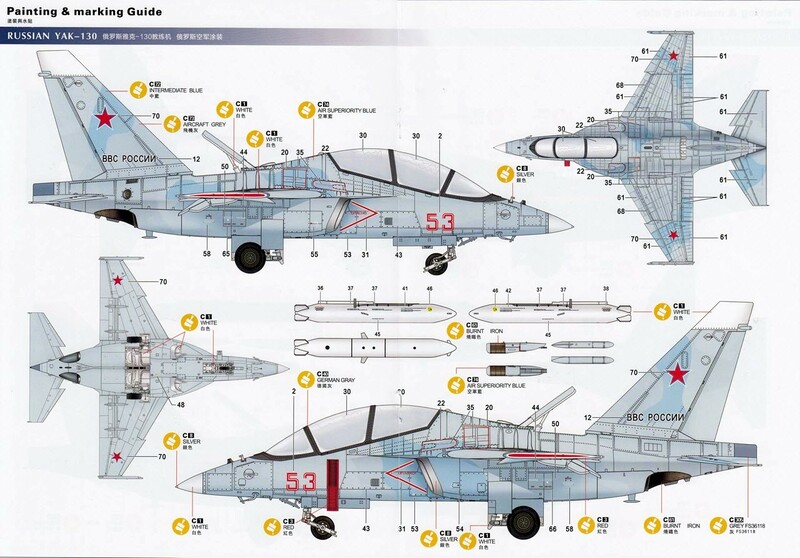 Russia has a total requirement for about 200 aircraft. 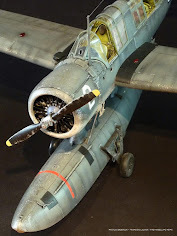 Kittyhawk continues to blaze a trail in 1/48 with yet another new tool aircraft for us. 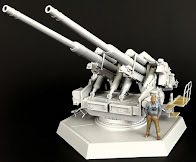 A quick search on scalemates.com revealed a few kits in 1/72 but in 1/48 I could only find references to future releases by ARK Models and Zvezda. 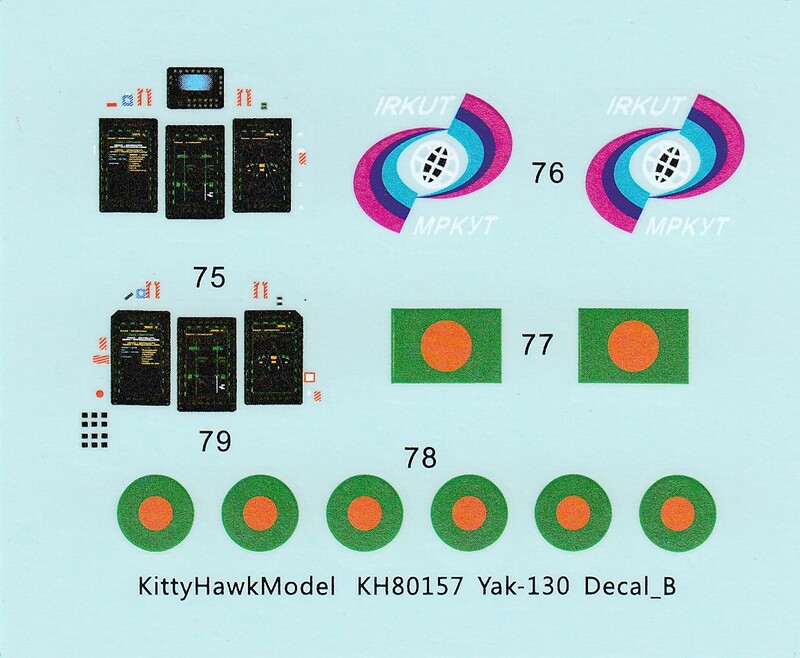 So it would seem that Kittyhawk are first to market in this scale. The box sports the "Elite Series" logo which has been around for a few kits now. Kittyhawk seems to have settled into a groove now with their toolings and as I expected the plastic is well engraved and mostly flash free. Full colour side profiles for each paint option are provided as is a small PE fret containing the seat harnesses and rear view mirrors. 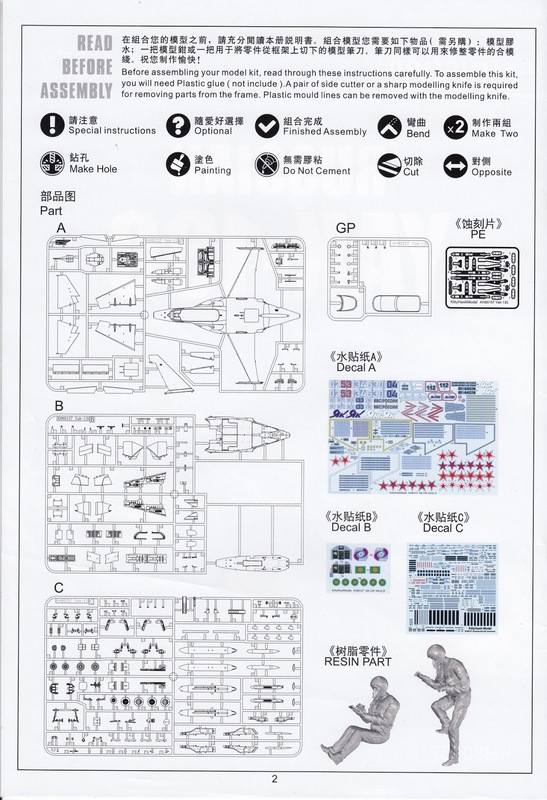 I really wish they would start giving us PE HUD frames because that's one part of most modern jet models that always looks over-scale in plastic. 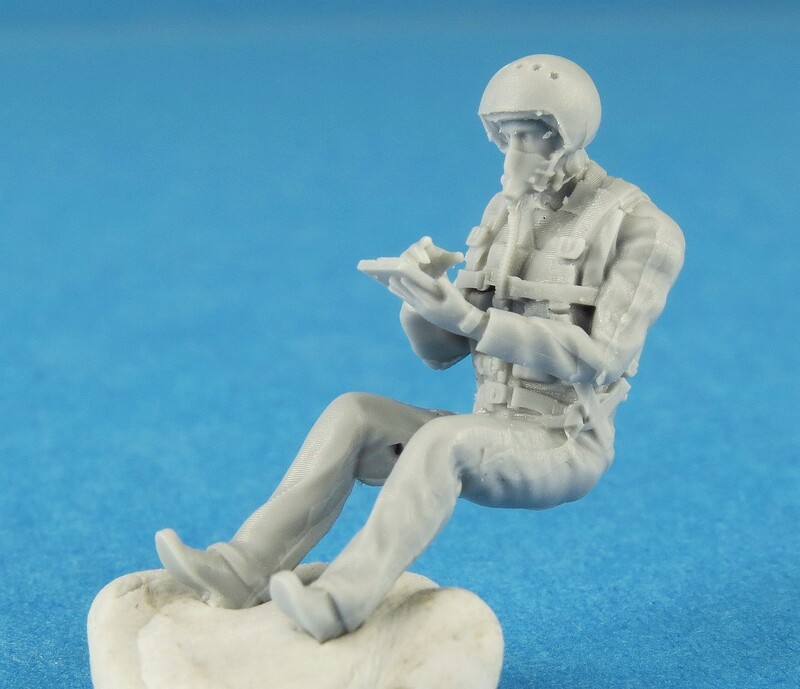 A good inclusion of two (nicely detailed) resin aircrew figures, one seated and the other climbing the boarding ladder. These look to have been 3-D printed (at least the masters probably were). 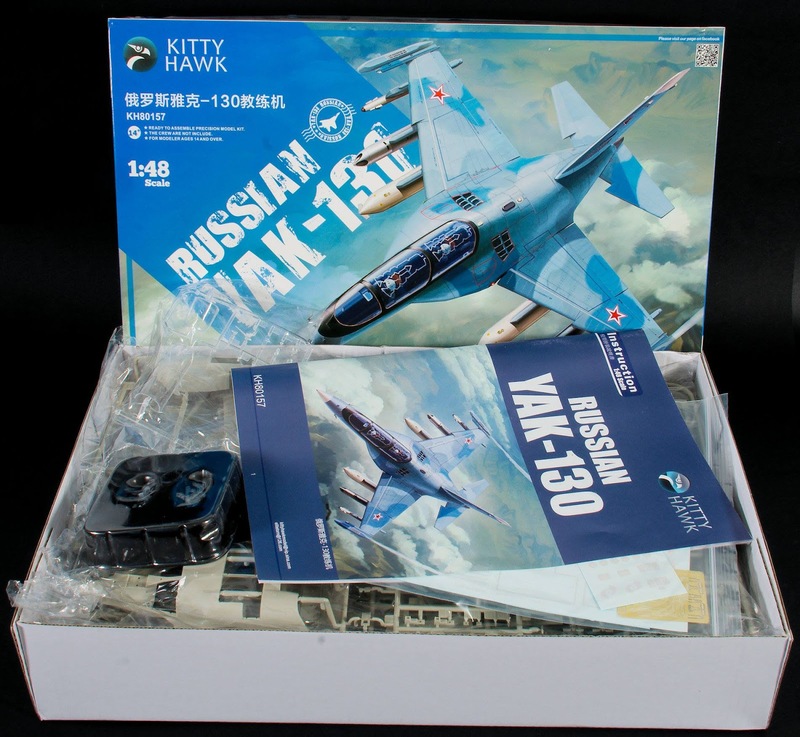 Kittyhawk have generously included a full set of their Soviet Aircraft Armament set (KH80151) in the box. 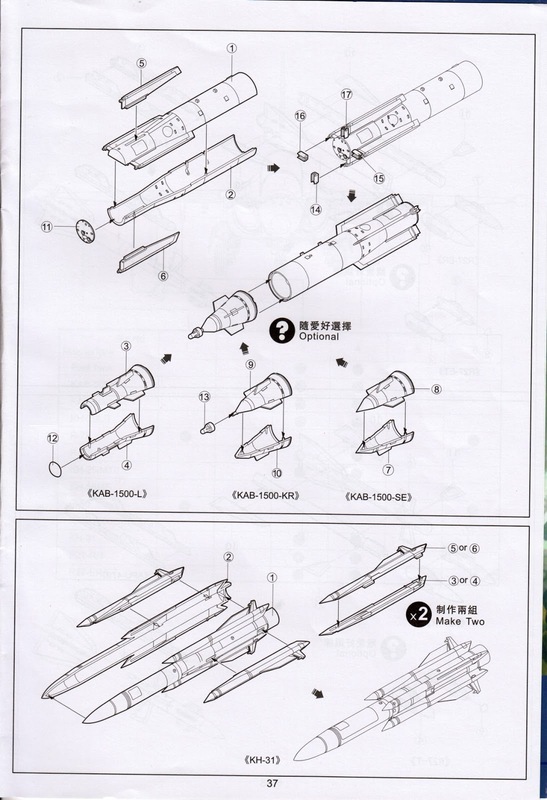 This results in over half of the sprues in the kit being weapons, so expect to have plenty of spare Soviet ordnance when finished. 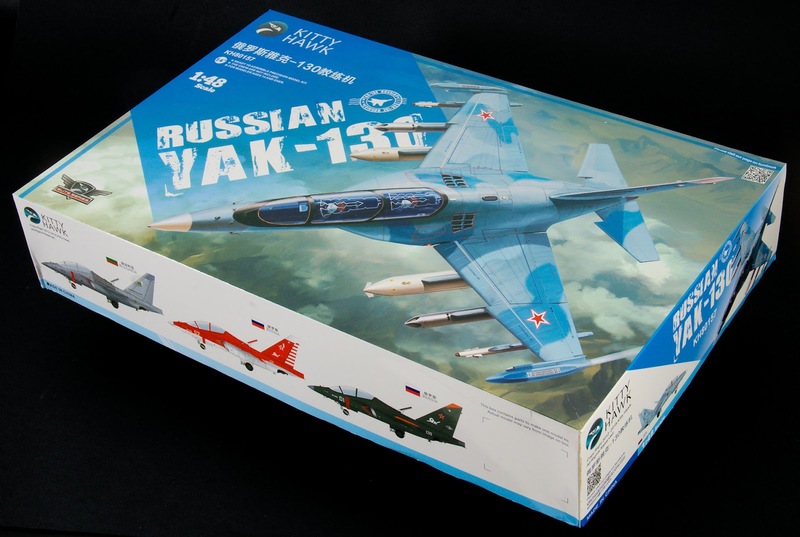 The Yak 130 is not a particularly big aircraft and even in 1/48 makes up into a fairly petite model. 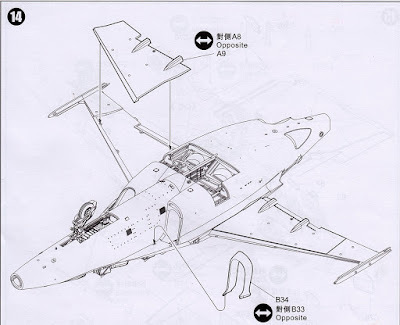 This aircraft would be a good candidate for 1/32 actually (maybe in the future) or for a dual display with two of them in flight. 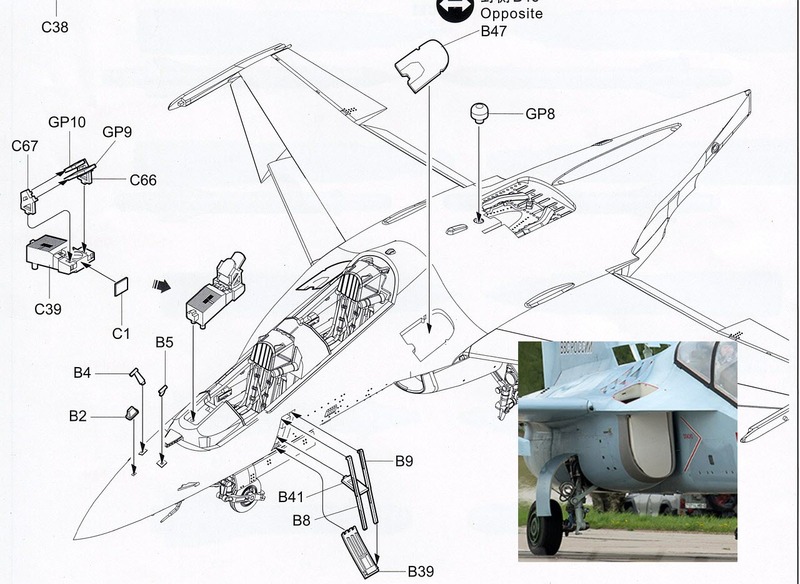 The Yak-130 is fitted with a K-36L ejection seat. 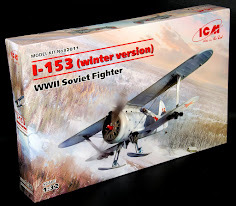 The K-36L-3,5Ya is a lightweight version of the К-36D-3,5 seat. The seat is designed to eject through the canopy transparency. 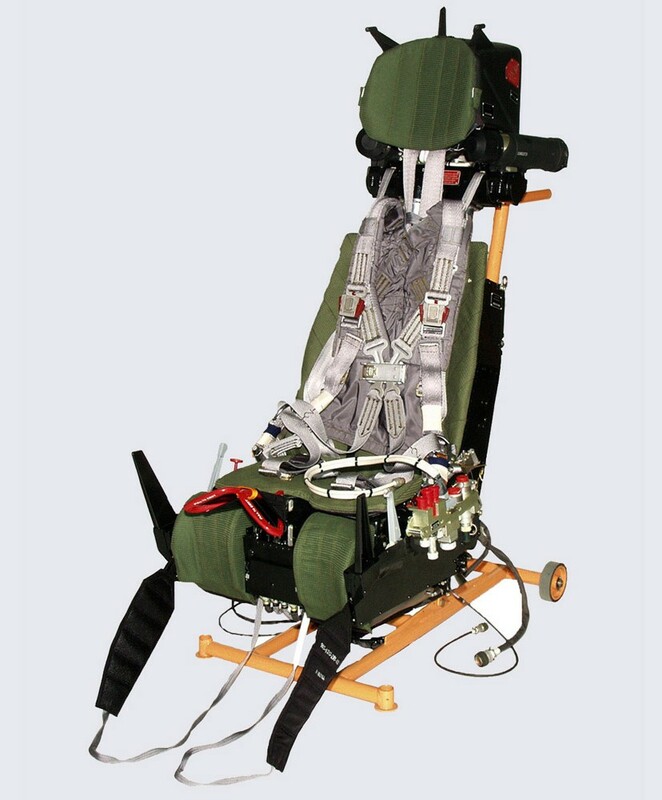 The Kittyhawk seats are made up from 12 parts each. I didn't try and fit the PE harness as I have found in previous builds its nothing like the picture and you end up guessing which way its meant to seat on the seat. 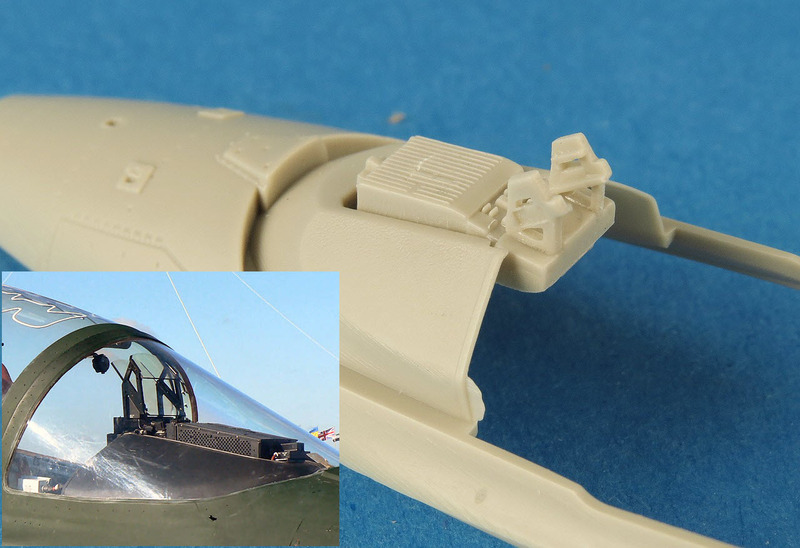 The seat-pan pull handle (fits between the pilots legs) is also provided in PE (part PE2), which is a good idea because plastic versions of this part always look over-scale to me. The Kittyhawk seat is quite detailed, however I don't really think it captures the overall shape and size of the real K-36L. 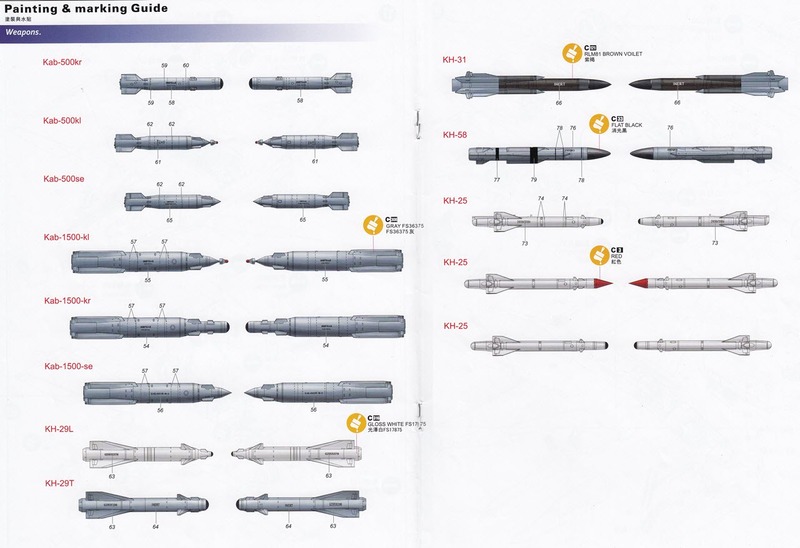 If anything it looks more like the more beefy K-36D, especially the large size of the head-box. 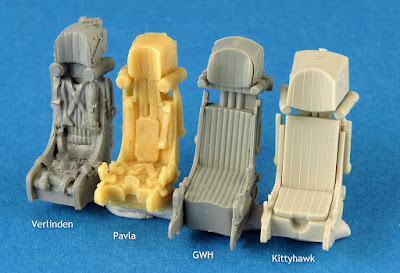 As a further comparison of the KH seat with other 1/48 K-36D variants, I dug out a couple of resin seats (Verlinden and Pavla) and one other plastic seat from the GWH MiG-29 SMT kit. 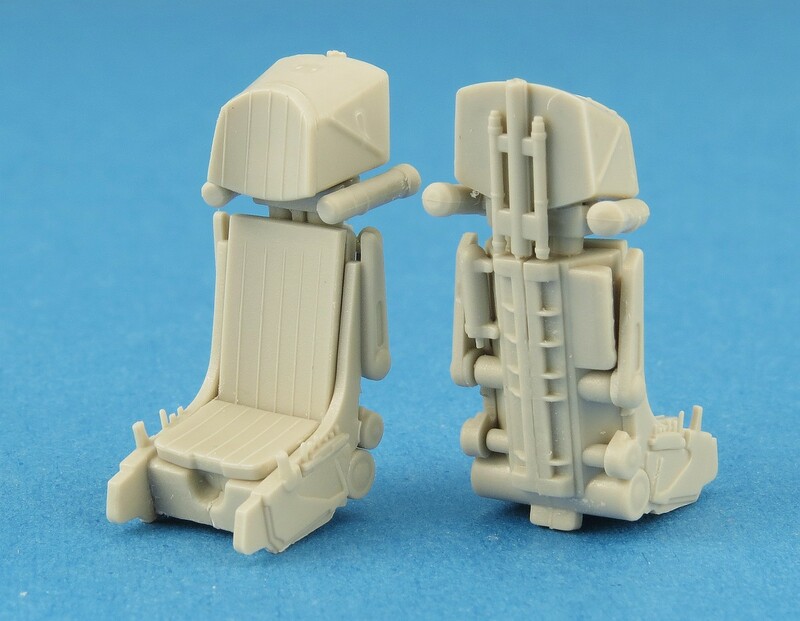 Obviously none of them look exactly like the K-36L photo either but in fairness the three other seats are meant to represent the K-36D variant. To my eye the Pavla seat is a closer match, especially the size of the headbox when compared to the over sized KH seat. The cockpit tub consists of separate floor pan and sidewalls. 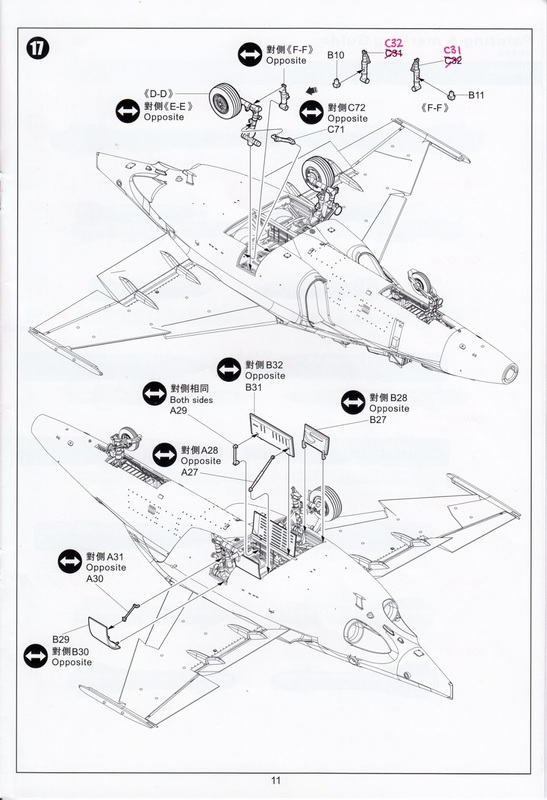 These look to be nicely detailed and the main IP's are provided with raised detail and decals for the MFDs in the front and rear cockpits. 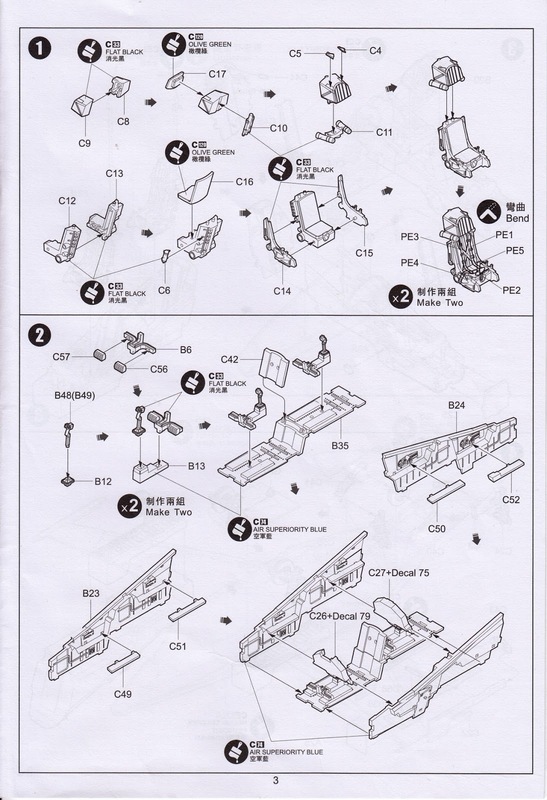 I assembled (glued) enough of the main cockpit parts so that we are left with three main sub-assemblies which, after painting, can be easily glued together. Each of the parts fits perfectly with all the provided alignment tabs doing their job nicely to keep it aligned properly. 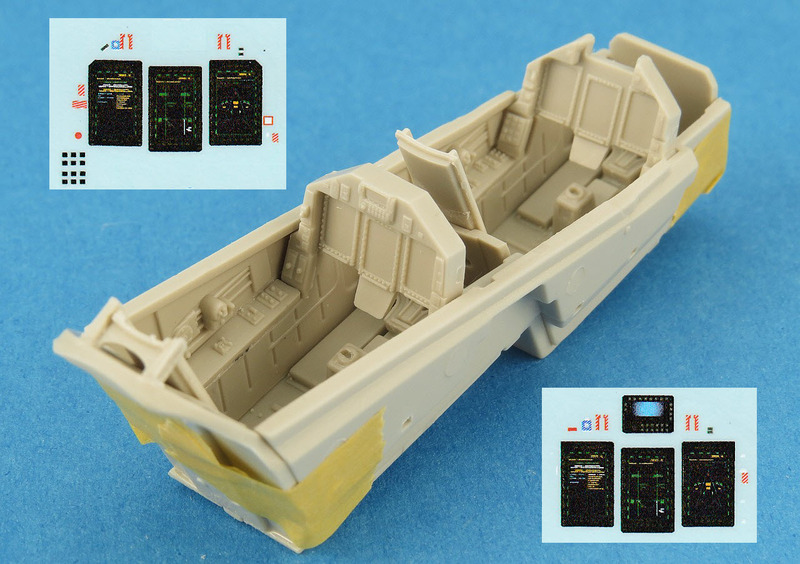 The bulkheads, seat rails and shrouds are added to the cockpit before the seats are installed. You'll notice from the photos that I deviated from the order of assembly suggested by KH by gluing the bulkheads to the floor prior to attaching the sidewalls. This sequence just made more sense to me as it will result in way less discrete parts to be painted and then be assembled. 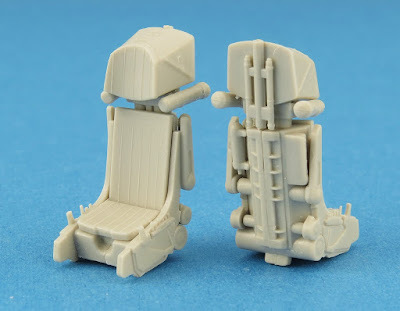 The kit seats are a good fit and other than those over sized headboxes are quite passable. 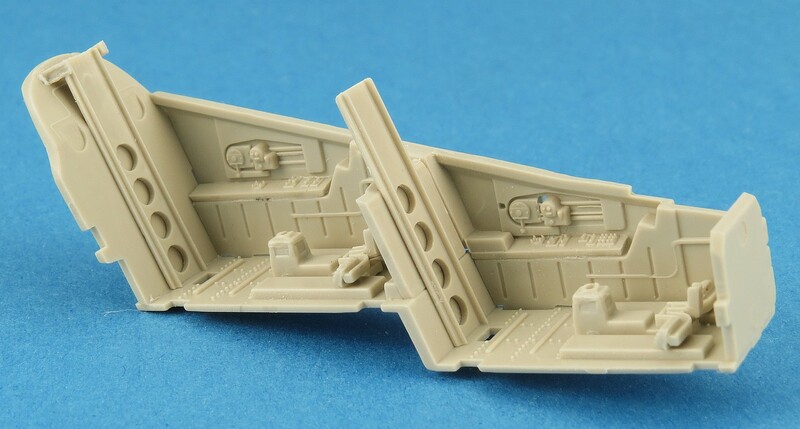 A couple of cockpit reference photos which will help you find a match for that blue interior paint. 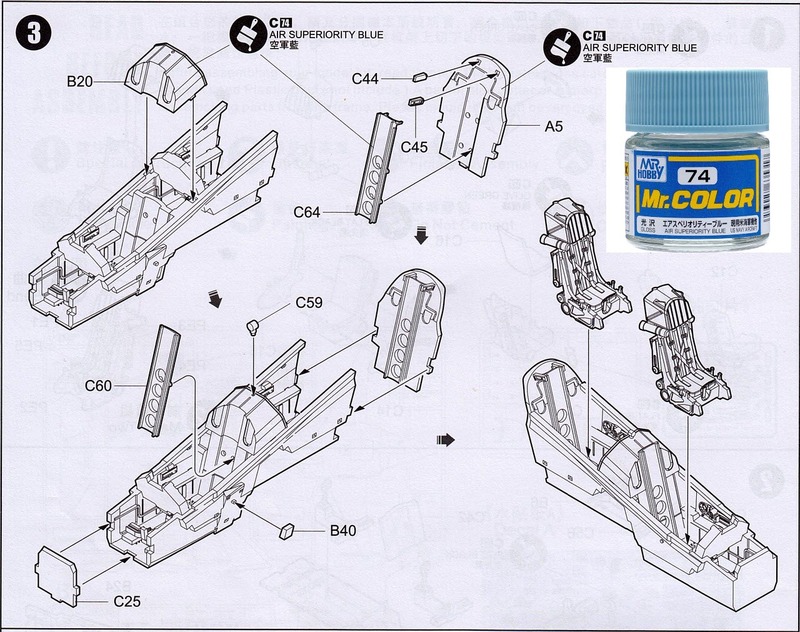 KH calls for Mr Color C74 Air Superiority Blue which looks to be a fairly close match. I'll reserve my final judgement until I apply it to the model. 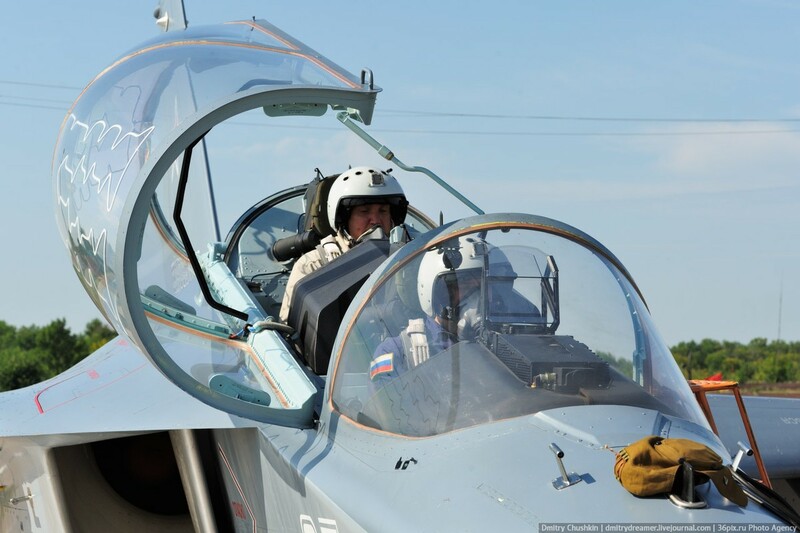 The instrument panels in the Yak-130 are pretty much full glass, with each cockpit containing three side-by-side MFDs. 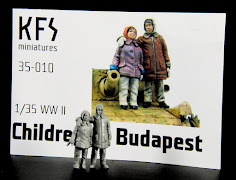 The raised detail around the edge of the displays is nicely done by KH. 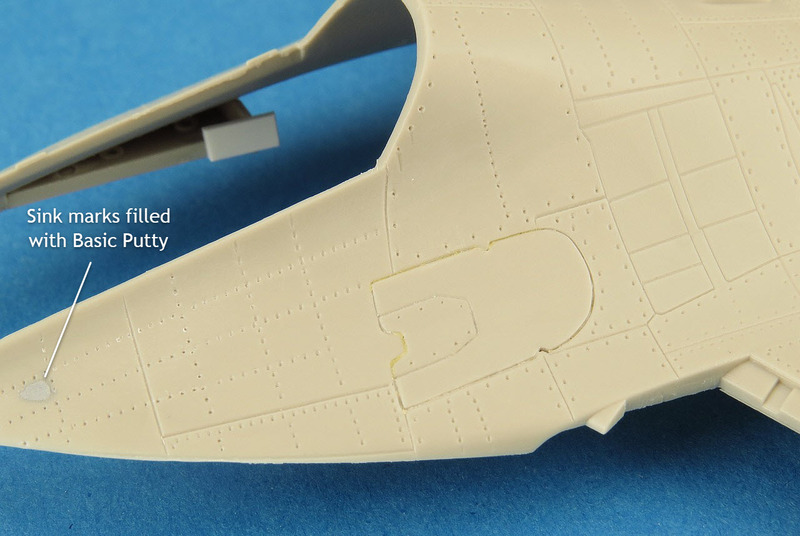 The MFD decals included in the kit are good if you plan to display the model with power applied. 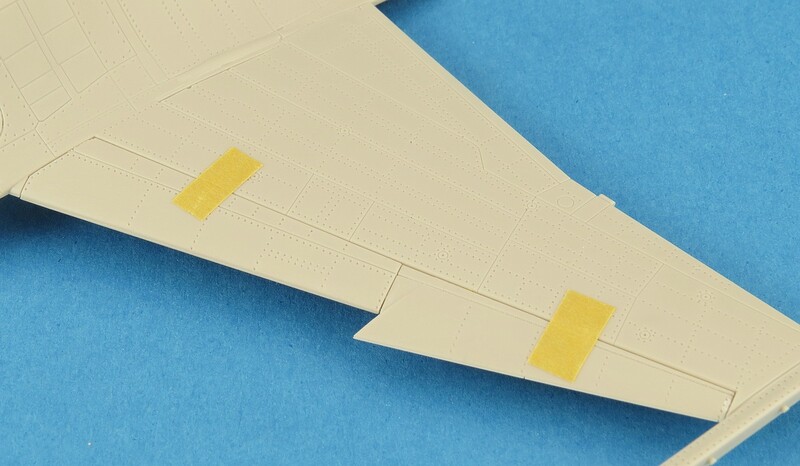 Each decal is a single piece so I would suggest you carefully trim each display out from the sheet before applying it to the model. The less clear carrier film you have to deal with the better. 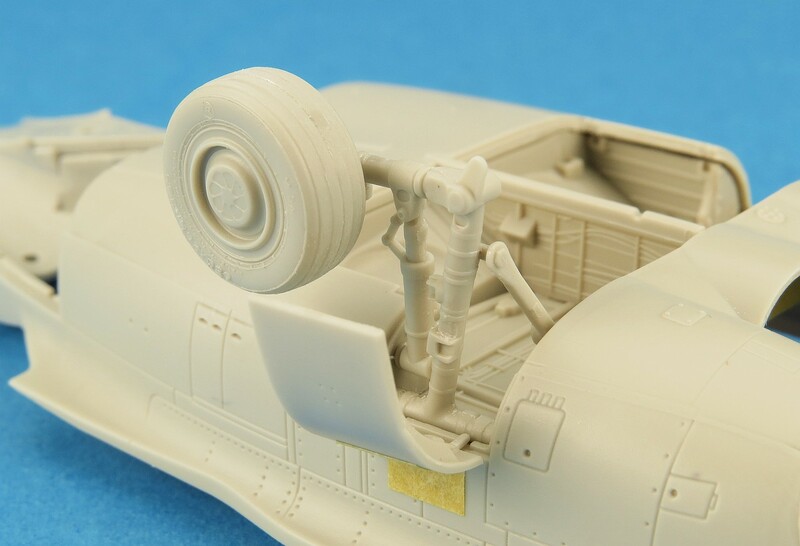 The nosewheel well includes ribbing & cabling detail and parts fit together well. 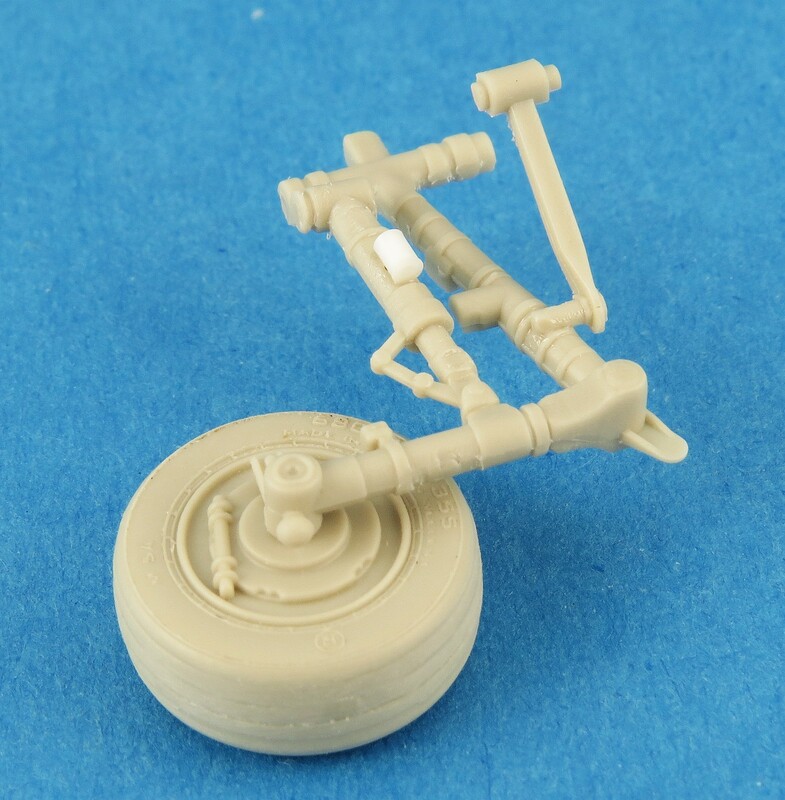 The nosewheel itself will require you to paint the wheel before final assembly of the strut and axle around it. The completed nosewheel strut is a pretty loose fit to the mounting hole in the wheel well. I'll most likely end up using some metal pins to give me a stronger/tighter fit. The walls of the well itself actually fit very snugly against the fuselage with little or no visible gaps once pushed up tightly. 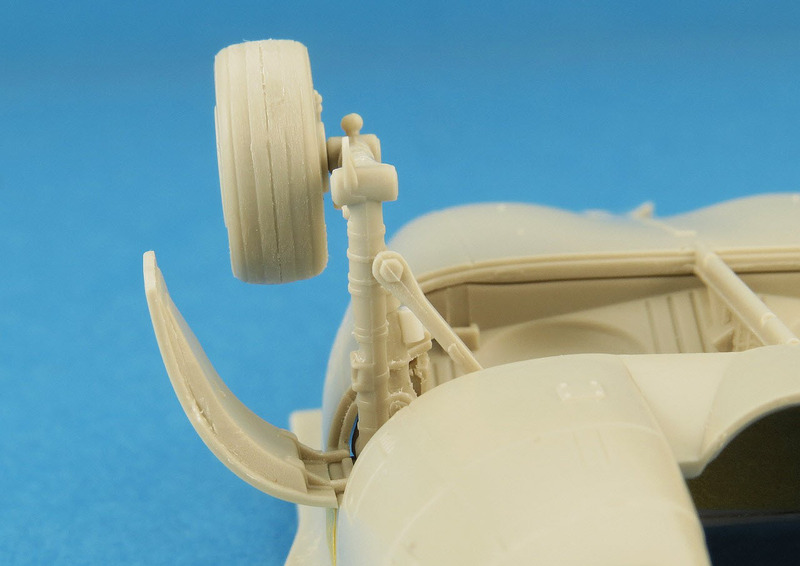 When compared to the real nose wheel the KH part seems a good match. 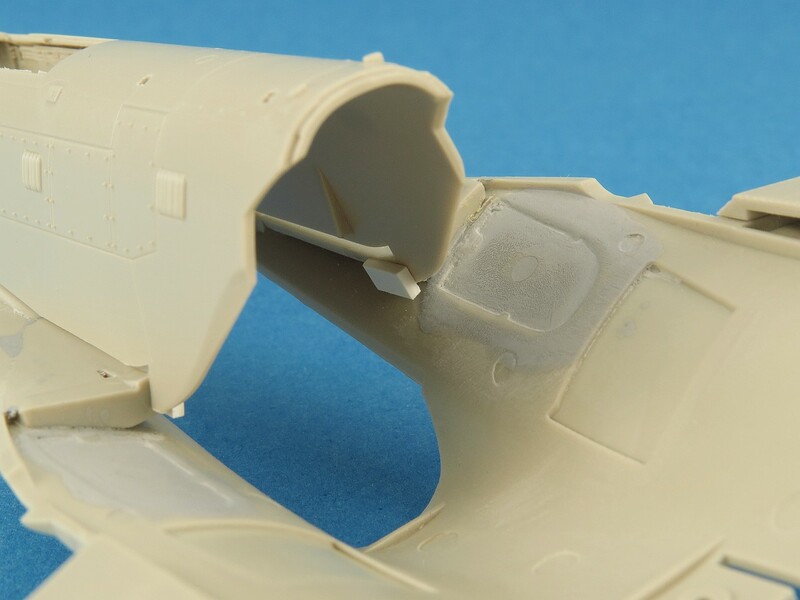 If you plan to attach the optional belly gun pack be sure to open the holes on the lower fuselage. 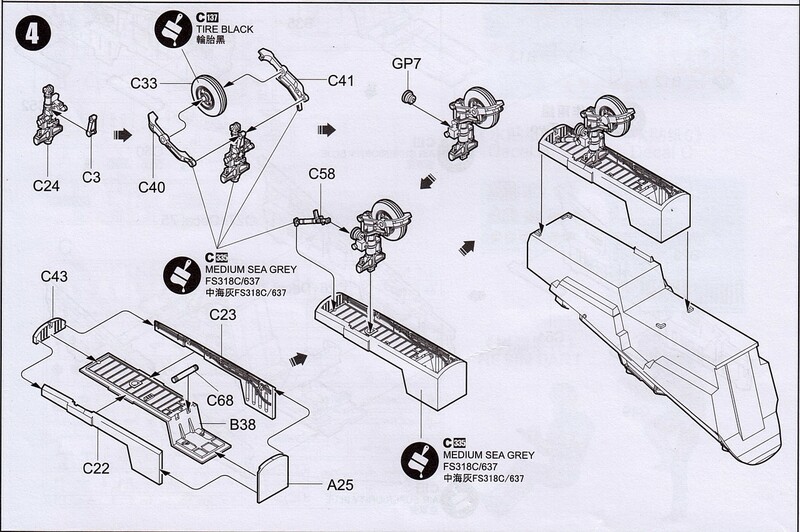 Likewise if you won't have the gun pack fitted, be sure to fill and clean up those holes. 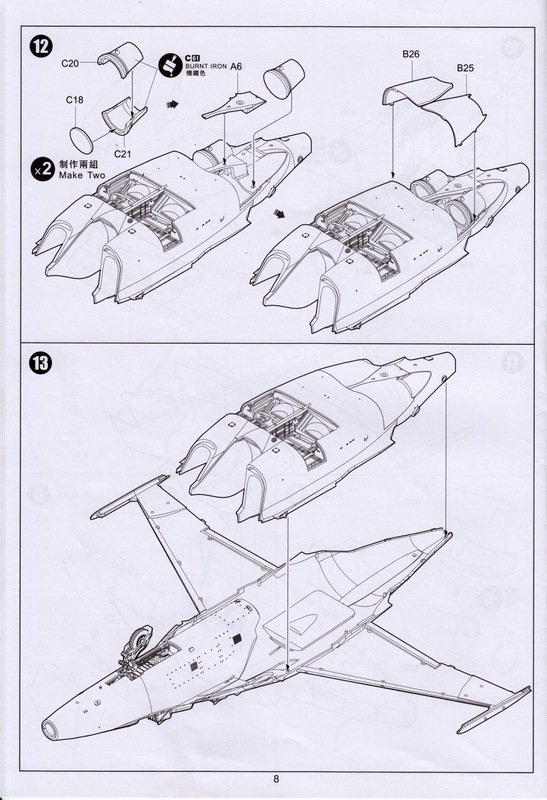 Again I decided to deviate from the KH sequence and mated the cockpit to the upper fuselage section first. I did this because it allowed me to better control the pressure applied to the tub and minimise the resulting gaps on the top join (which is way more visible on the finished model). 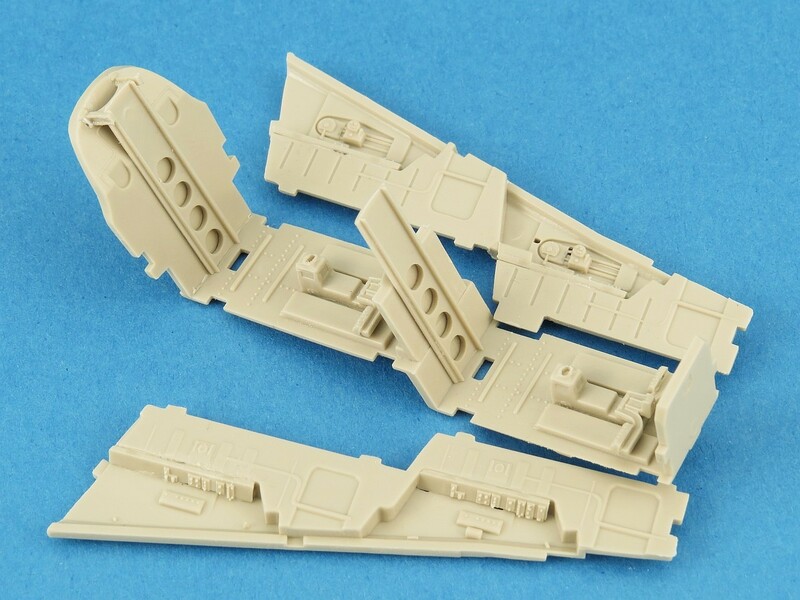 If you plan to display the air-brake in the open position then now is the time to paint the interior well and attach from the inside. 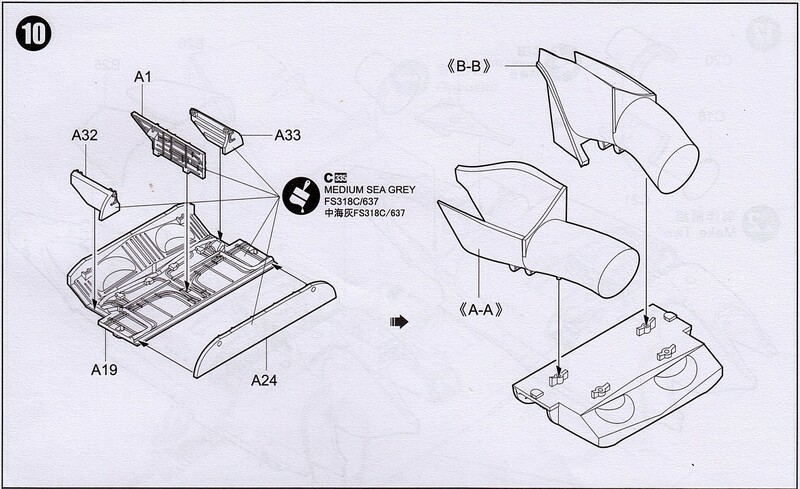 The lower surface of the LEX are provided as separate parts (B44, 45) and are glued into place now. 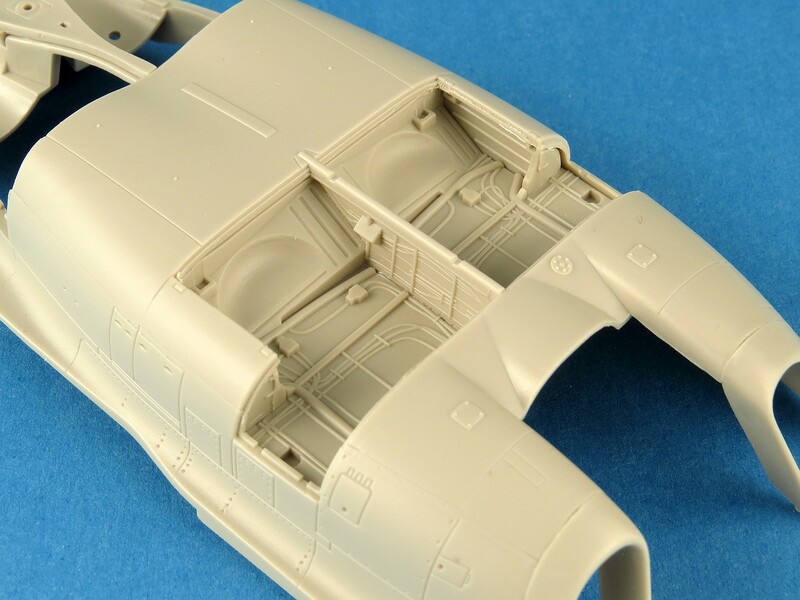 While dry fitting the lower forward fuselage section I noticed that it did not spread widely enough to sit correctly aligned with the LEX sections. To rectify this I used a couple of small sections of 40 x 80 thou card to give me some tabs against which the sides of the lower fuselage could mate. This worked quite well with the result shown here. 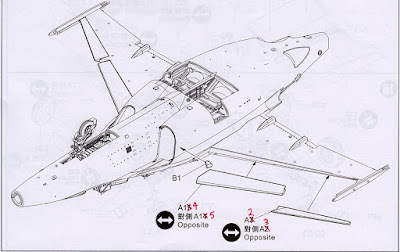 Prior to mating the lower and upper front fuselage I would suggest to add some weight to the nose interior, just forward of the cockpit section. 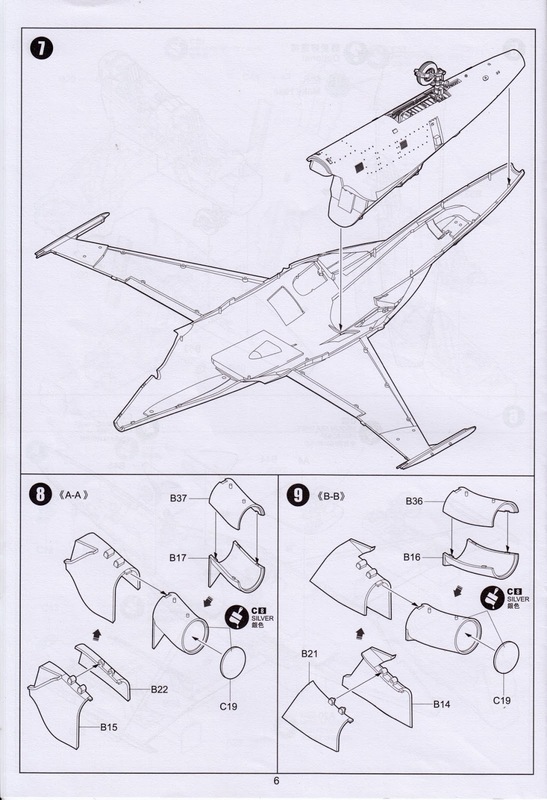 This will help ensure the model is not a tail sitter. I like to use small circular lead fishing weights, secured using two part epoxy glue. 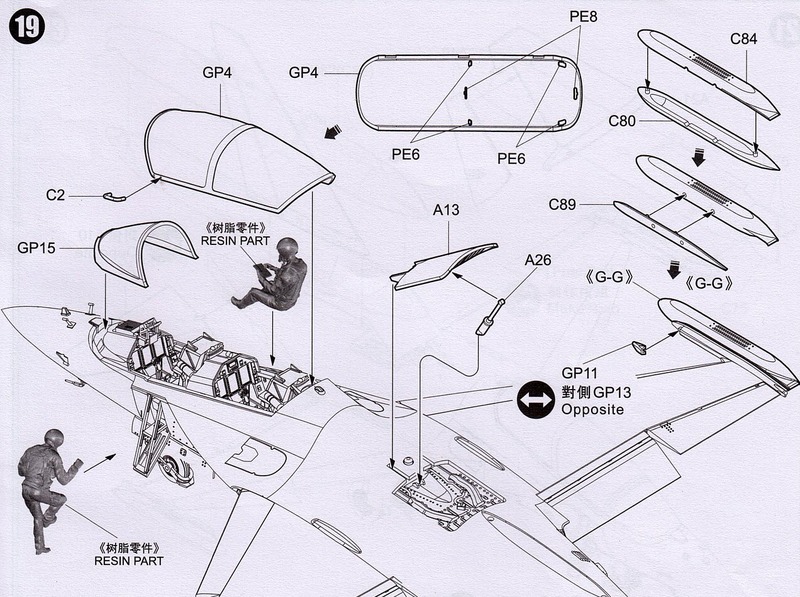 As can be seen from this picture the mating of the two fuselage section results in a gap free fit. 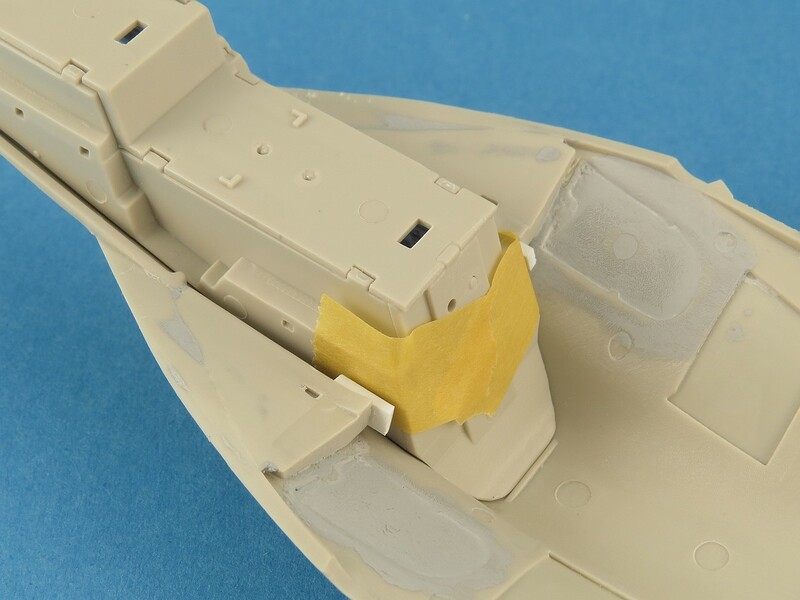 Also notice how you will need to be careful when sanding the seam as there are several vertical panel lines and rows of rivets that across it. 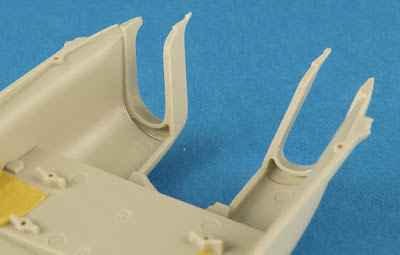 When test fitting I noticed that the forward section of the cockpit sidewalls (front cockpit) did not align properly with the canopy sill. Looking at why I noted that the front IP was sitting to high which prevented the tub from mating properly. I later trimmed the IP (by about 1mm) to fix this small problem. Perhaps the most involved part of the construction of the model is the engine intake and trunking. 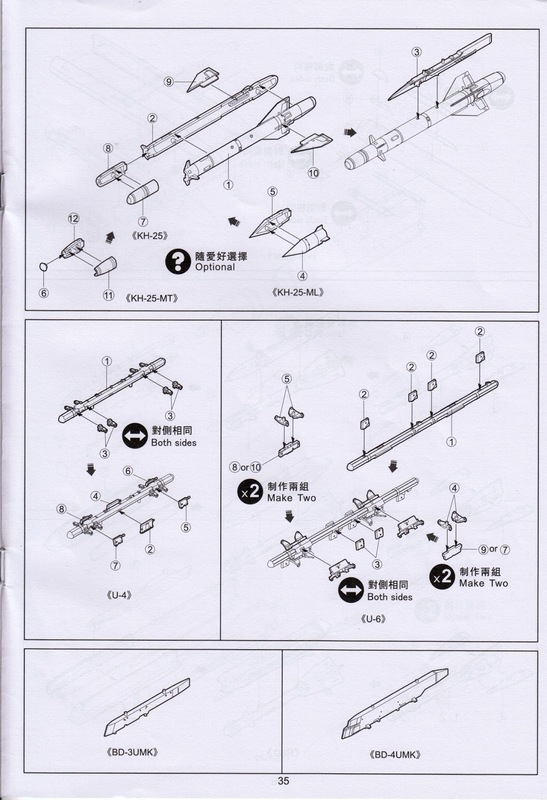 The trunking consists of four parts on for each side. After initially following the sequencing suggested by KH of building the intake trunking from the inside out (IE start with inner sections and finish with the intake lips) I felt that a better option would be to start from the outside (IE the intake lips) and work inwards. 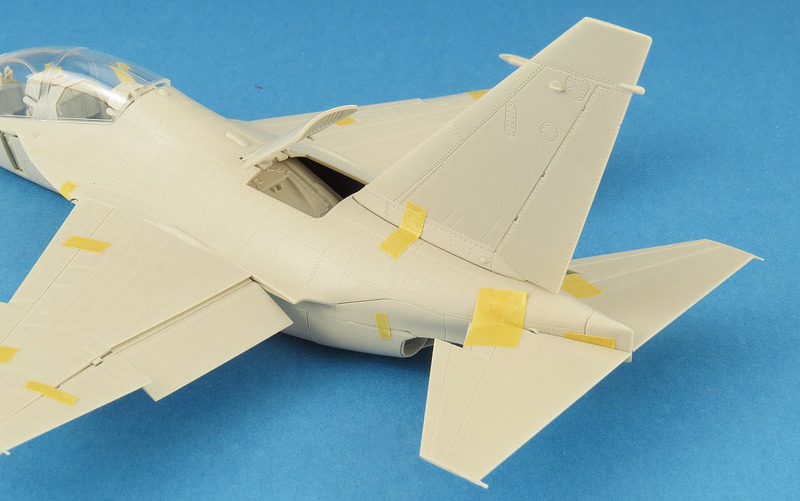 To that end I began by gluing the two intake lips to the fuselage. I was able to achieve a join that was perfectly aligned with no steps or gaps. As this is perhaps the most visible part of the finished intakes I wanted to make it look as good as possible and use it as the fixed reference point onto which the remainder of the interior trunking would be built. With the lips firmly secured I next attached the first section of intake trunking (B14/15 & B21/22). 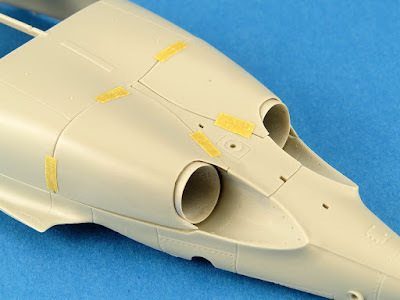 Rather than focus on minimising the gap along the join of these parts I instead focused on where they mated with the intake lips and taped them in place so the sides were flush with the lips as best I could. Interestingly this resulted in quite a wide gap forming where the trunking itself joined together. I was not worried about this gap because I could fill it later with putty and sand smooth. It did however prove to me that had I glued that trunking together before mating it to the lip I would have had a much bigger problem with the lip not matching the trunking. Once the glue dried I removed the trunking from the lip and filled any gaps along the interior seams with Tamiya Basic Putty. I sanded this smooth and then coated with Mr Surfacer to remove any minor blemishes and also to visually check my work. I firmly believe that by starting with the lips as a fixed reference point I was able to save myself a lot of work dealing with misaligned section of the intake trunking. 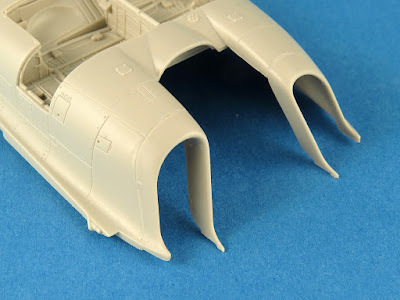 Next up for the interior was the main wheel well. This is a pretty easy assembly and because it was all the one colour I glued all the parts together now (rather than paint each separately and then assemble). 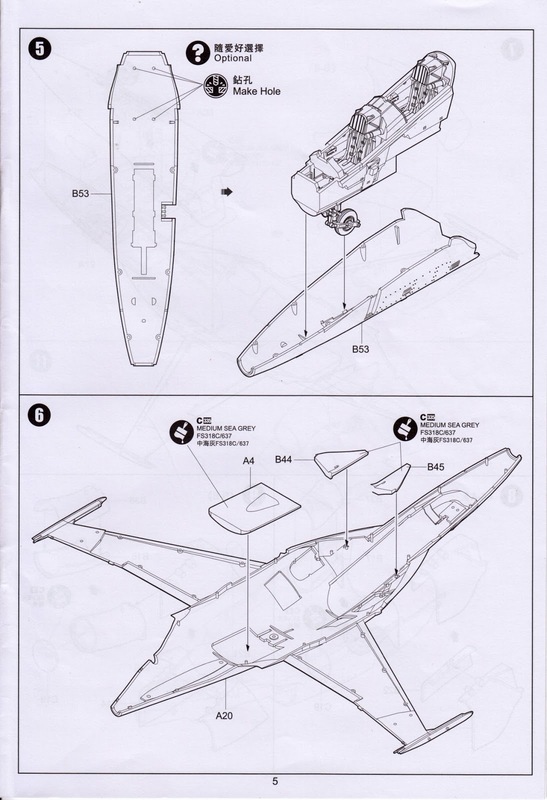 The fit of the parts is excellent and as can be seen it drops and aligns correctly with the lower fuselage. 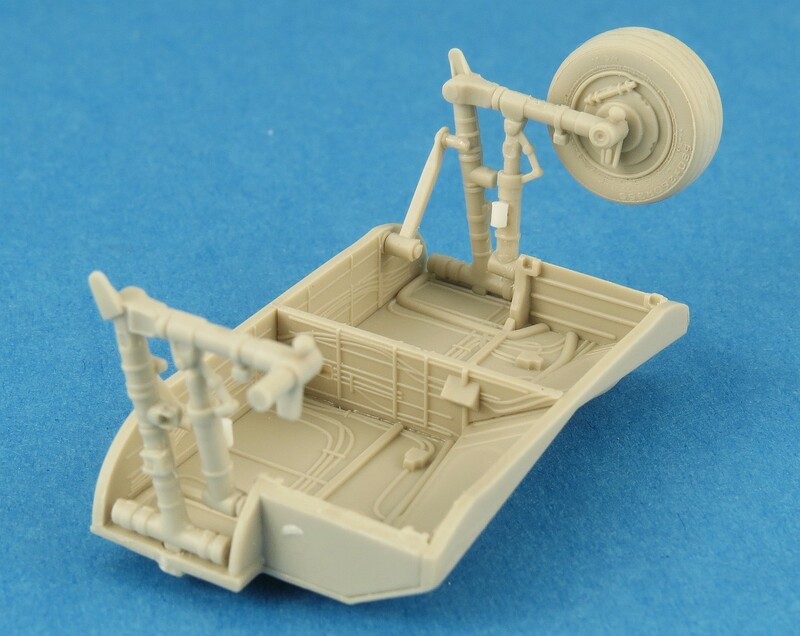 The moulded on wiring looms will take some patience and steady hand to paint but should result in a adequate result for 1:48 scale. Turning now the rear end, the exhaust nozzles need to be assembled from two halves (top and bottom). Obviously this leaves us with tricky seams to deal with. 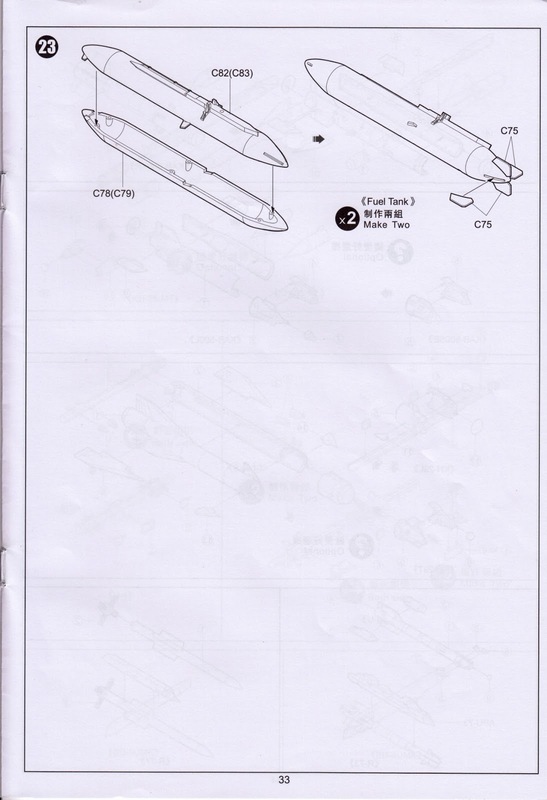 I found that the alignment pins on the exhausts where not that precise when offered up the fuselage so you'll need to pay attention when gluing to keep them straight until the glue sets. 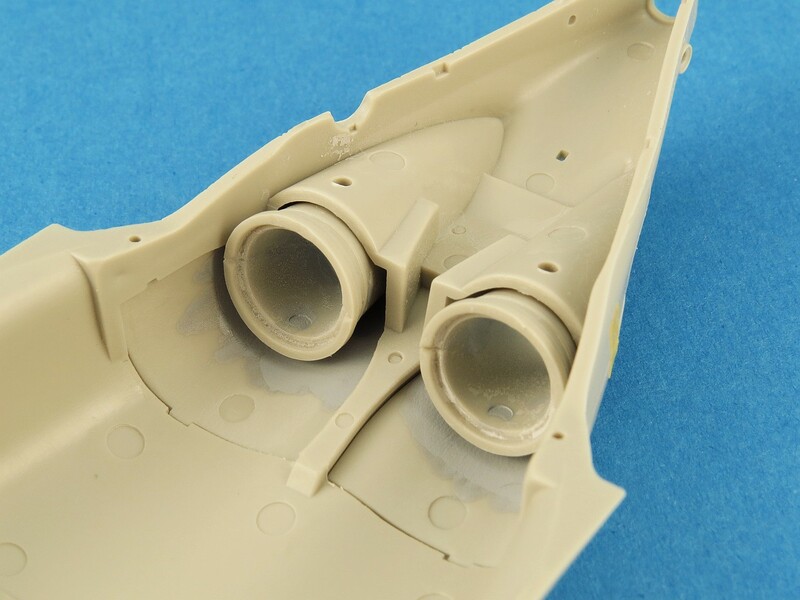 The interior of the exhausts have some noticeable ejection pin marks that you will want to sand out. I also took the time to thin out the trailing (outer) edge of the nozzle as the kit part looked quite over-scale. Before proceeding too far into the assembly of the exhaust section I wanted to deal with some seams where part A6 joined the main fuselage. Its easy to deal with now (before you start to close things up) by just filling and sanding the join seam with putty. If you ignore this seam and try and come back later once you have installed the nozzles it will be a pain to deal with. I was keen to attach the exterior covers (B25,26) before the nozzles and testing showed this to be possible if you remove a small amount off the nozzle locating pins. They are then able to slide into position from the inside and be glued. 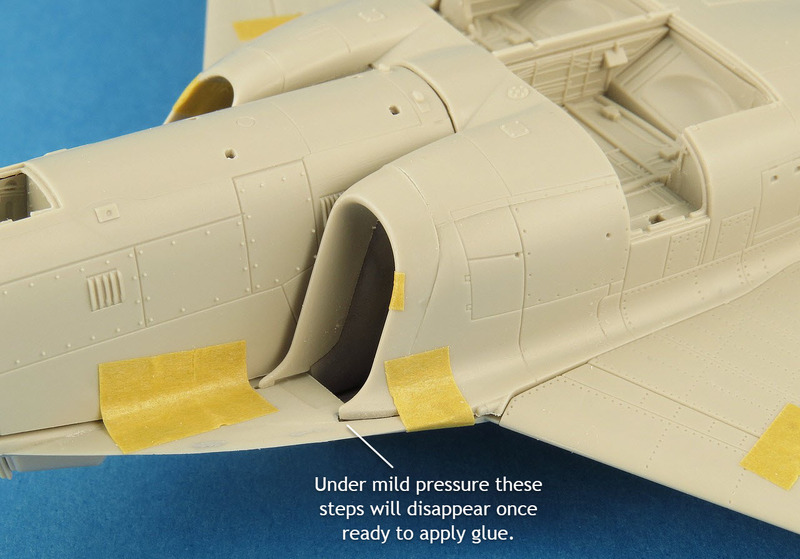 Doing it this way gives much better access to apply glue to the interior seam of the covers without the nozzles getting in the way. 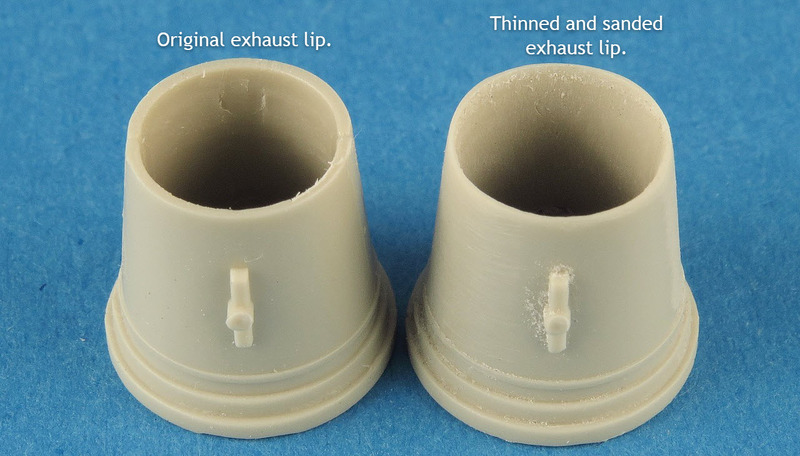 Notice the improvement of the look of the nozzle lips after thinning them to scale. 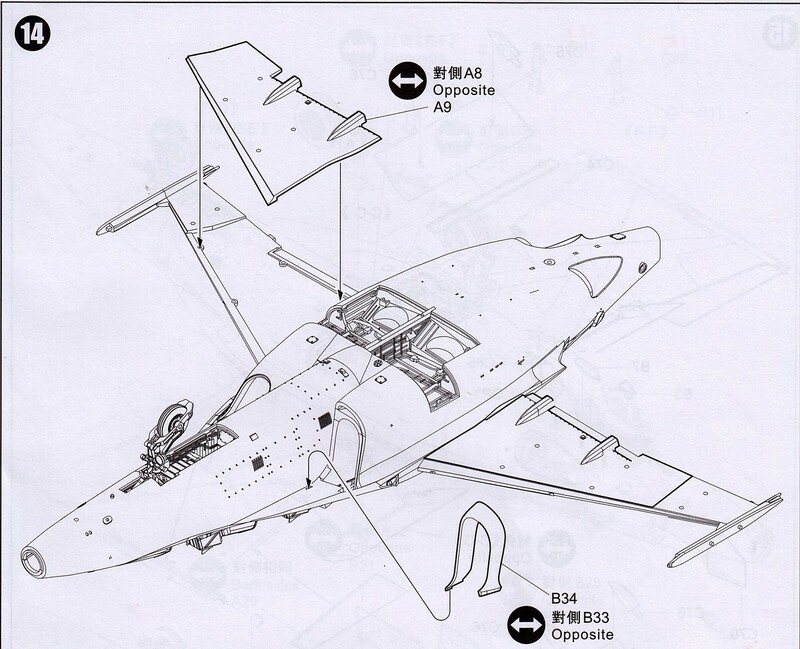 Once you are happy with the lower fuselage it can be mated to the upper fuselage. A couple of things worth mentioning about changing the build sequencing. 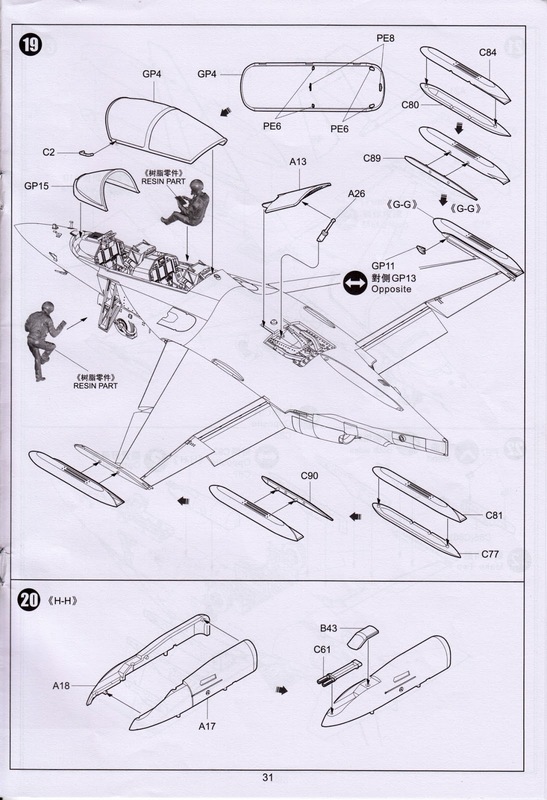 I opted to install the wing lower surfaces prior to fitting the lower fuselage. 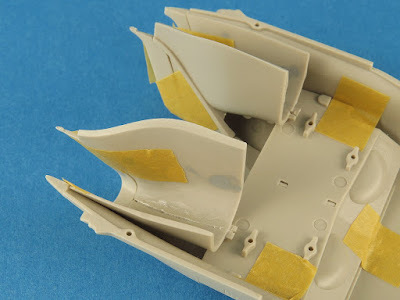 I also inserted the FOD cover plates (parts B46/47) now and gluing them now as it allowed me to glue from the inside rather than wait until step 18 as suggested by KH and glue from the outside. 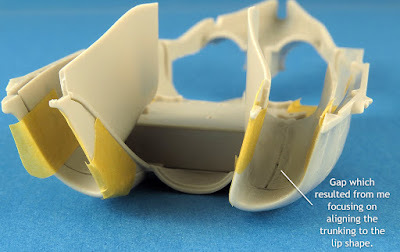 Experience has shown me that you are far less likely to make a mess if you glue flush panels onto a model from the inside rather than the outside. 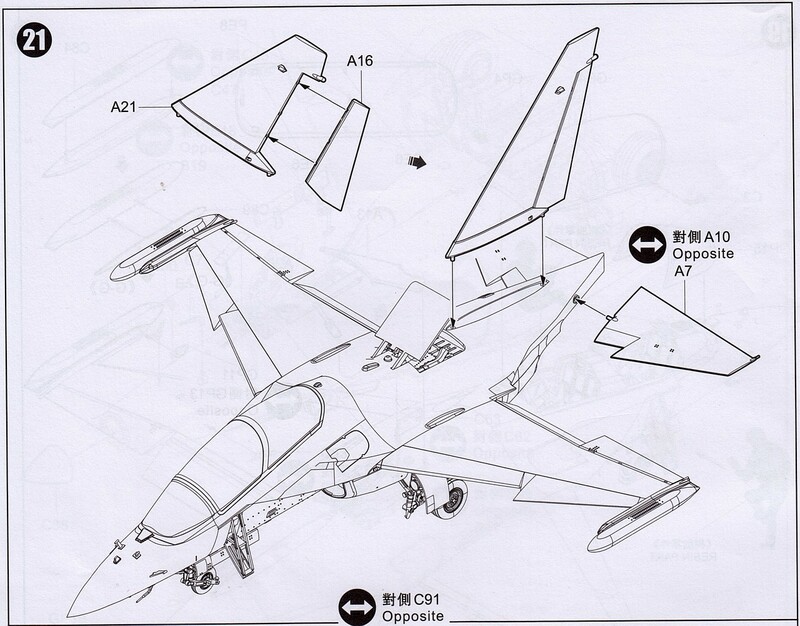 Like we saw on the nose the tail seam intersects a bunch of panel lines and rivet runs. 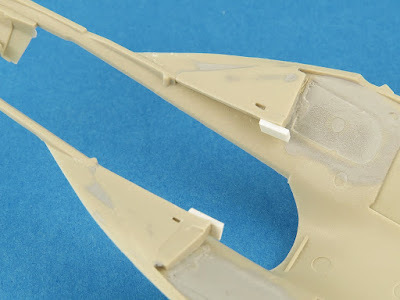 On my kit the panel lines were very poorly formed on the upper fuselage section (as shown here) and so I will need to sharpen these prior to gluing and then tidy up/repair after seam sanding. 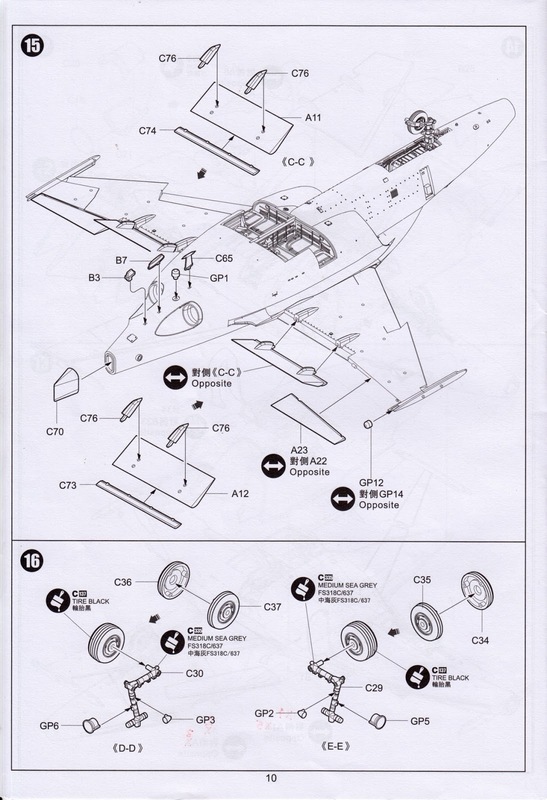 A little bit of trimming and cleanup was needed when mating the main fuselage halves. Because I already had the intake lips attached I was able to test and sand easily to achieve an optimal fit. 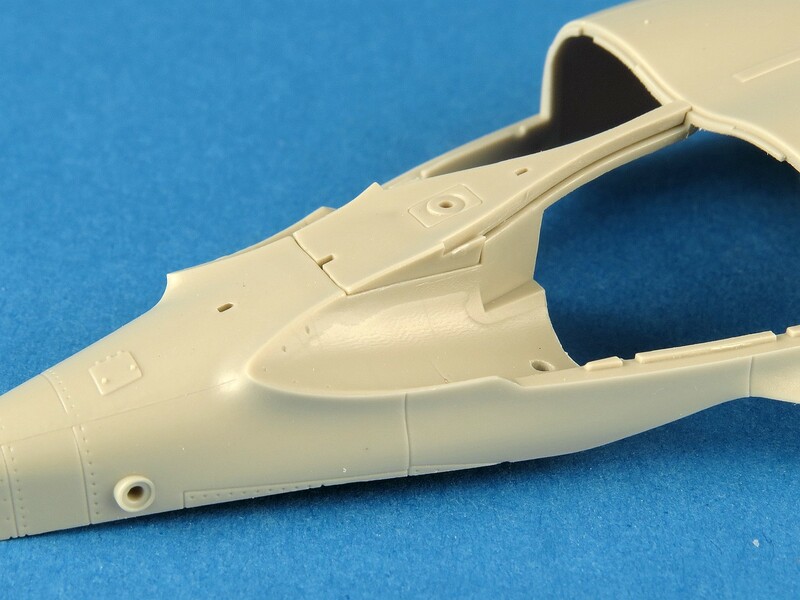 As mentioned earlier by the time we get to step 14 I had already attached the intake lips (B34/33) to the lower fuselage and the lower wing inserts (A8/9). 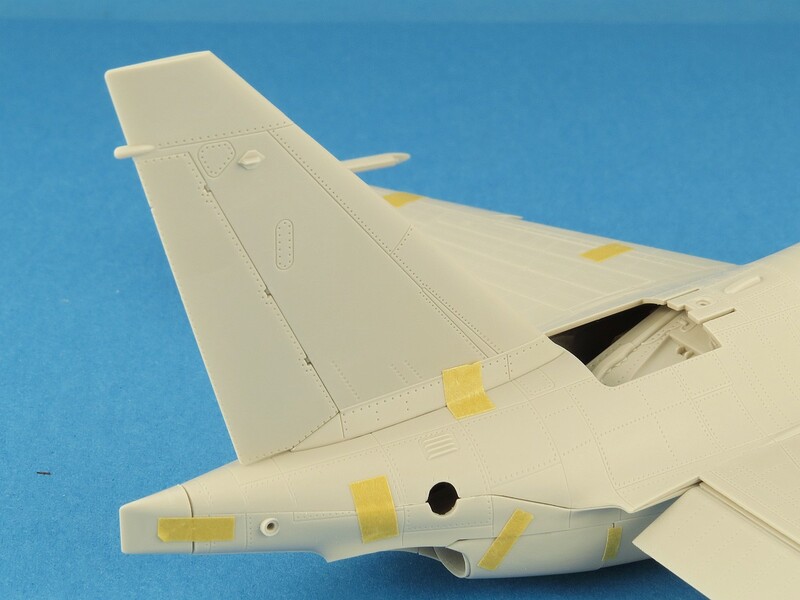 As can be seen here the lower wing surface plates are an excellent fit, requiring no filler or seam work at all (thumbs up KH). 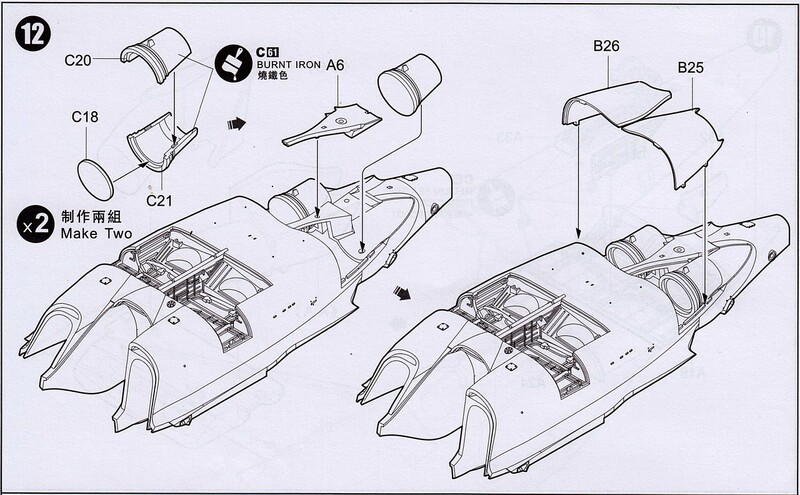 KH provides all the control surfaces as separate parts. This can sometimes be a blessing (can be re-positioned) and a curse (poor fit with gaps). I'm happy to report that the slats, flaps and ailerons on the wings are an excellent fit. 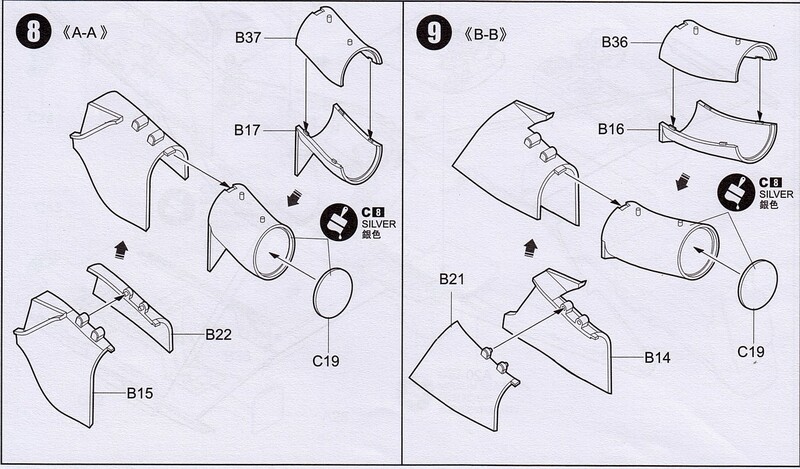 Note that the part numbers are incorrect on the instructions (just reverse them like I did). 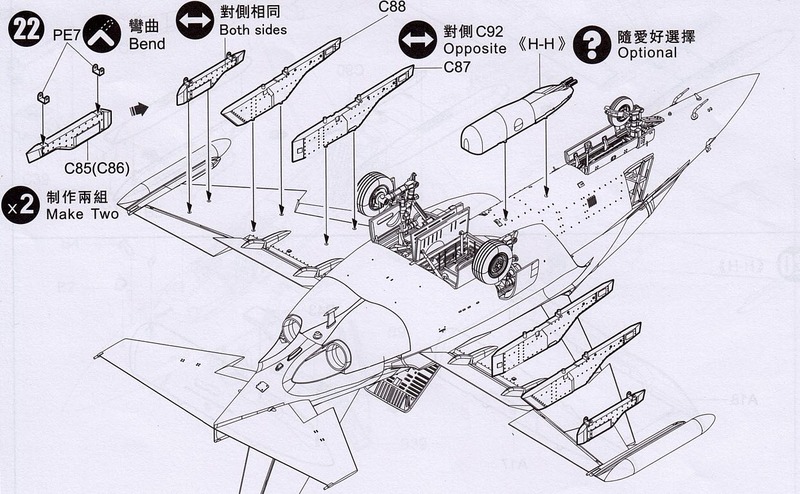 Whilst not immediately obvious from the diagram, it is possible to position the flaps fully retracted (just leave off parts C73/74). 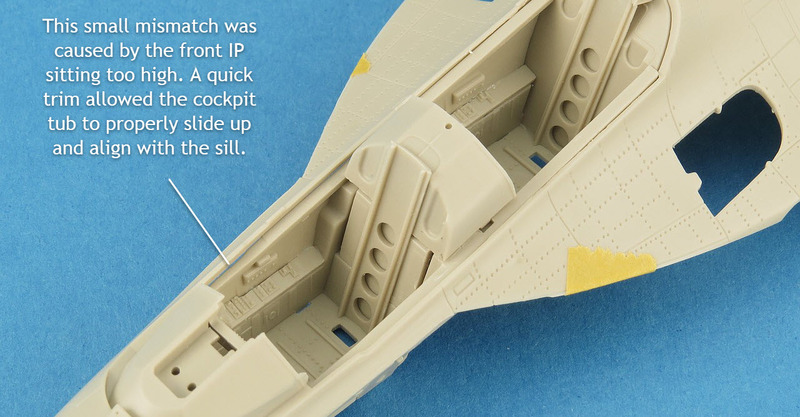 The locating lugs for the flaps are a nice tight fit which makes it easy to set the flap to your desired position. 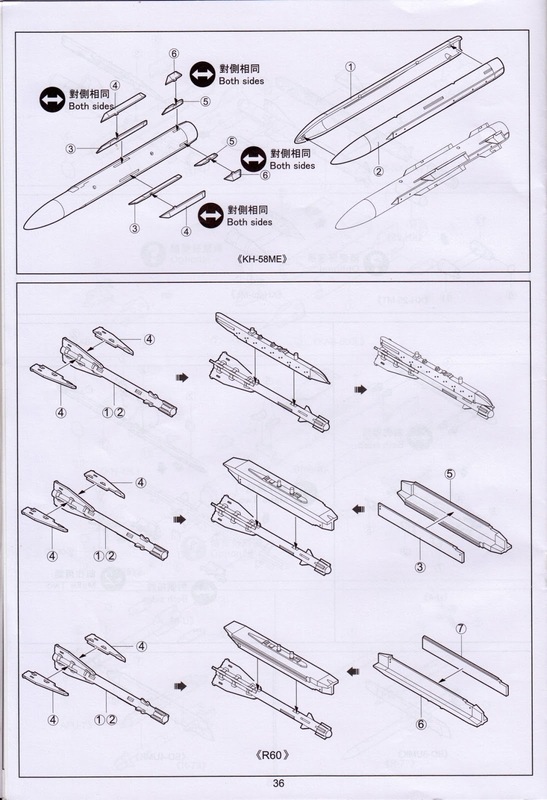 Pay attention to which ailerons you use are they are not interchangeable. 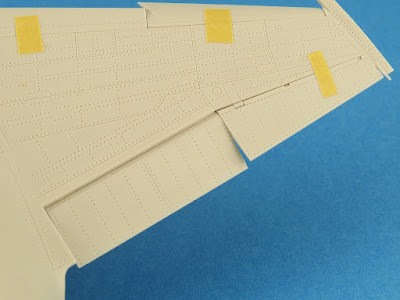 The fit of the flaps and ailerons was excellent and I appreciated the ease which which I could adjust the flap position prior to gluing. 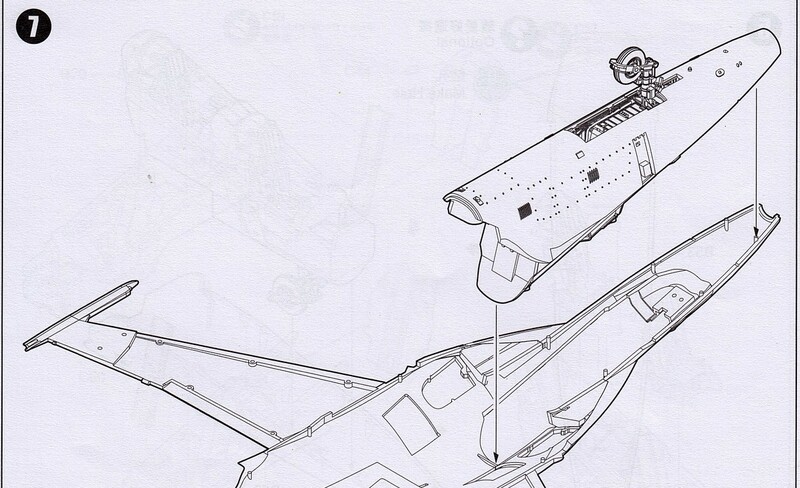 With the main fuselage components now mostly complete it's time to focus on the main undercarriage. The main wheels are provided in two halves and tread patterns that will only be retained if you sand the seam gently. 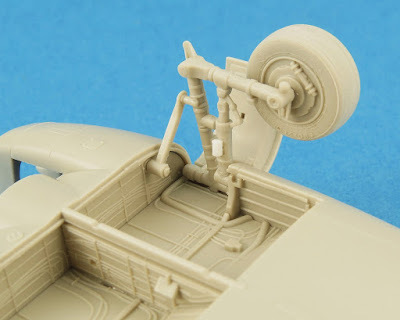 Whenever possible I like to assemble as much of the landing gear prior to painting and so I set about attaching the parts to the main gear bay and used it as a jig to ensure correct alignment of the various struts as the glue dried. 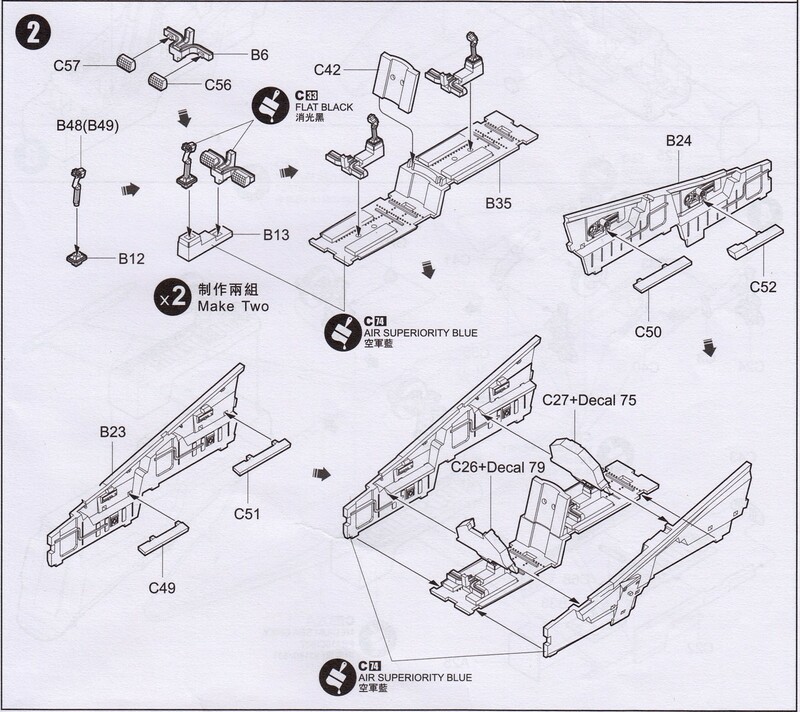 Once again KH have managed to confuse the location of parts for the landing gear by incorrectly labelling the instructions and designing parts which just don't seem to fit properly (without modification). 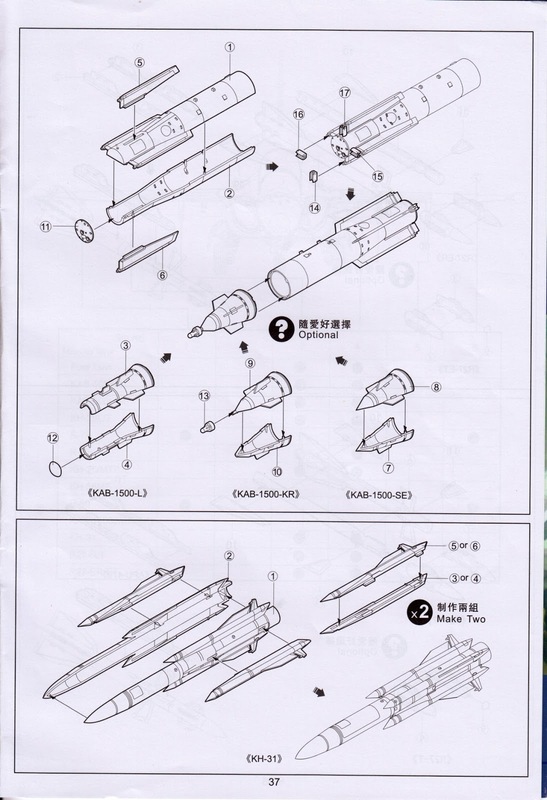 For example, parts B10/11 on the sprue look nothing like the diagram (or the real A/C) and so I discarded them and replaced with some simple white plastic rod. 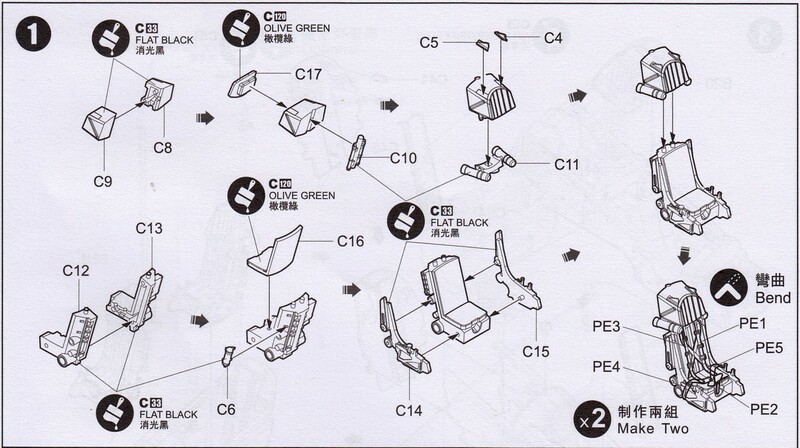 Additionally parts C31/32 are incorrectly labelled on the instructions (just swap them around). It took me a little bit of head scratching and test fitting before I figured out the issues. 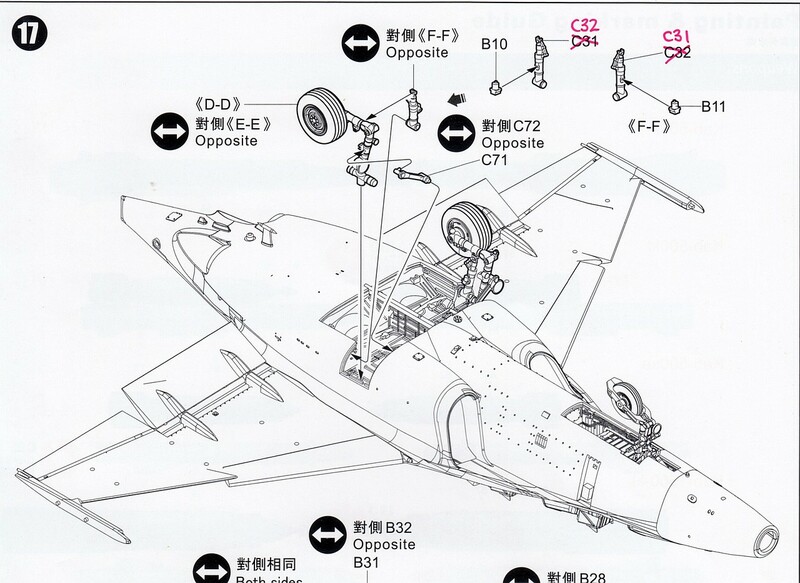 Once you decipher the KH instructions the main gear actually fits pretty nicely. 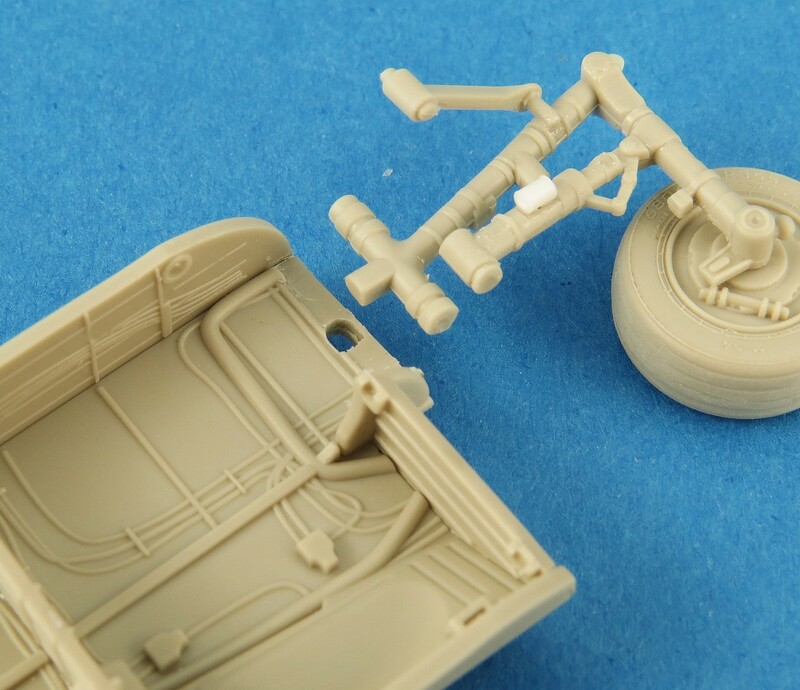 Each main gear assembly can be removed and painted as one piece which makes things cleaner down the track. I found the fit of the main gear locating pin to be very loose (it wobbled a lot). Despite having a decent sized locating pin the hole in the main gear well floor was not deep enough to let it sit properly. An easy fix was to drill out the hole so the pin could penetrate deeper and result in a tighter (more stable) fit. 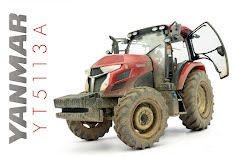 KH provide all the main gear doors so that you can display them in the open position. 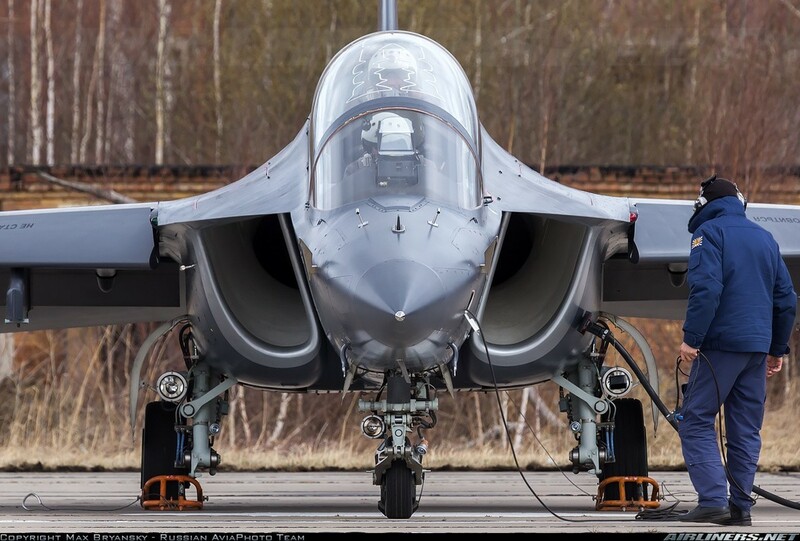 The Yak-130 is one of those aircraft that normally has all the main gear door closed, even when powered down. The main doors only during the gear retraction/extension cycle. So ... if you want to save yourself some time (and be completely accurate) just glue the main gear doors (A29 and B27/28) closed. Overall the fit and alignment of the main gear and doors is very good. The FOD doors on the Yak-130 appear to operate on a hinge and when lowered (blocking the main intake) also provide an auxiliary intake for the engine. KH only provide for the option to have the door closed (although you could probably modify it easily enough deployed). As mentioned earlier I glued these in place whilst I still had access to the inside of the fuselage. The HUD is also now assembled in preparation for the clear parts being attached. The closed FOD door is a decent fit. The yellow filler you see here is Milliput which I applied from the inside (like the glue) and then squeezed it through any small gaps to block them off. If you were so inclined (I did not check the fit) it may be possible to attach the doors in the open (lowered) position. Another (all too familiar) KH design flaw can be found when attaching the HUD frame (which I really wish they would start giving us in PE rather than plastic) there is meant to be a tab on the frame and a hole to fit it into on the HUD body. As you can see the hole is missing and instead we have two tabs (Doh!). 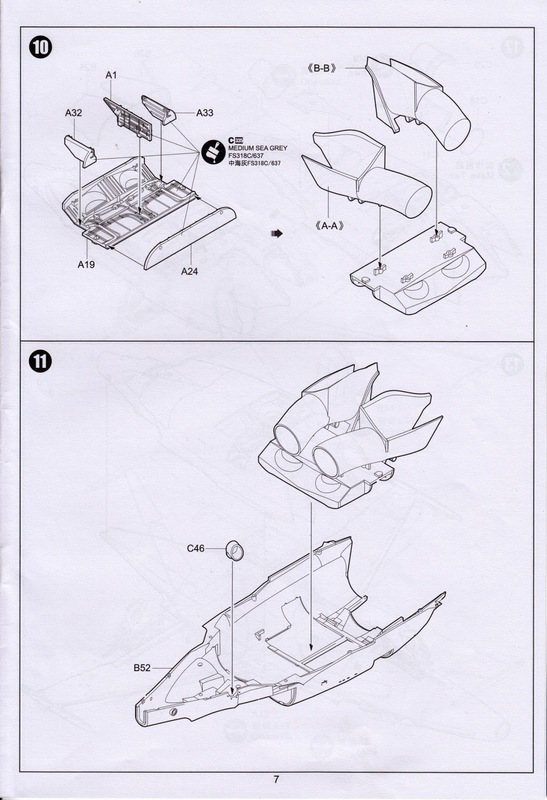 Solution is to just remove both tabs and but glue the frame to the body. The completed (except for the glass) HUD is fitted to the pilots shroud. The HUD frame would really benefit from being made from PE as this would be far more to scale. Kittyhawk have of late been providing at least one or two resin goodies in the box. 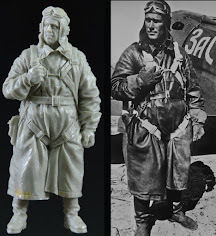 This time around its a couple of nicely detailed pilot figures. Despite the poses of the figures (one seated, the other climbing the ladder) the main canopy is not really designed to be attached open. The provided hinge attachment points are not really strong (or defined) enough to allow the large double canopy to attach securely. I'll have top experiment with somehow pinning the hinge with brass rod, but it would have been nice not to have to go to that trouble just to display the canopy open. The included resin pilot figures are very well detailed and the poses look realistic and natural. 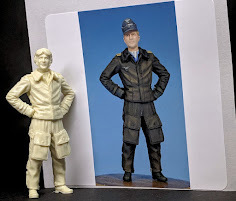 When looking very closely at the photos I noticed they seem to have been 3-D printed (you can see the layers on the seated pilot photos). 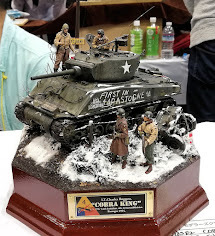 Not sure if every one was printed or just the masters who were then copied in resin. The last thing which I felt was a bit odd was that both figures have their oxygen masks on. The seated figure I could believe, but the guy climbing the boarding ladder just looks odd. 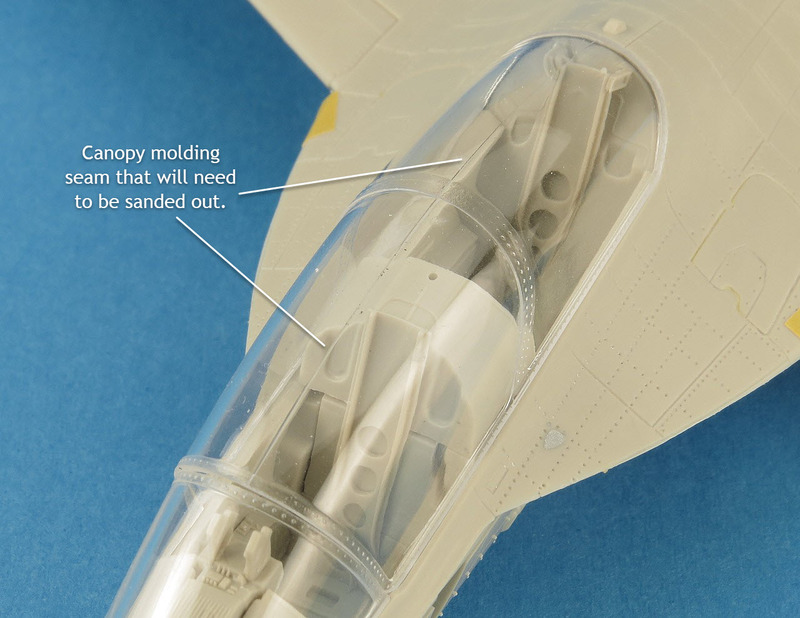 A nice clear photo of the open canopy which shows that there appears to be a Plexiglas divider attached to the canopy which separates the front and rear cockpits. 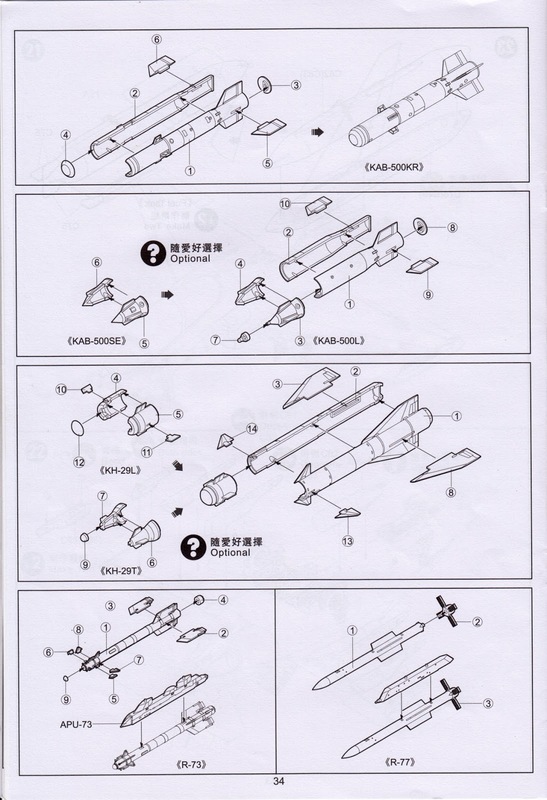 This is not provided by KH in the kit but should be easy enough to make from clear sheet. Also notice the locking arm attached to the windscreen frame to hold the open canopy. 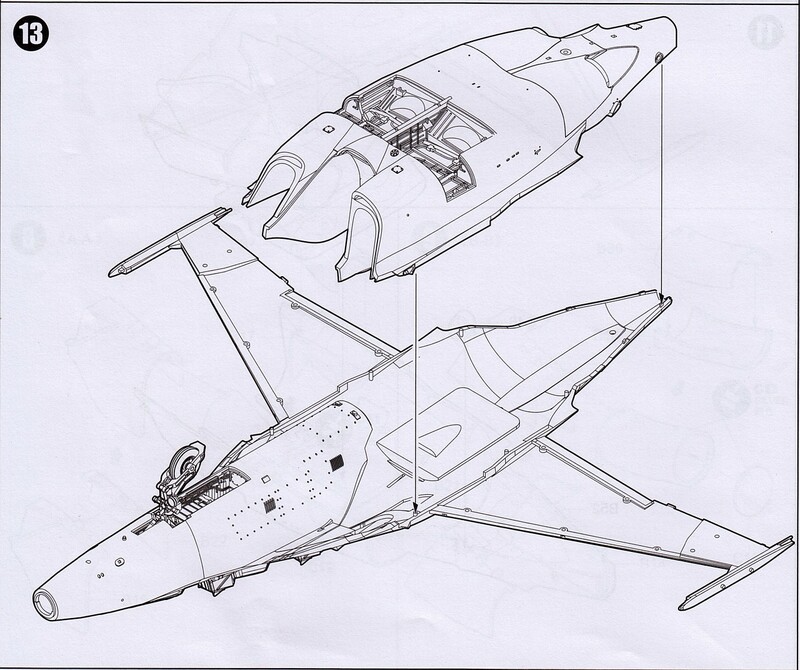 Some good reference also of the details on the pilots like the helmets and oxygen mask. 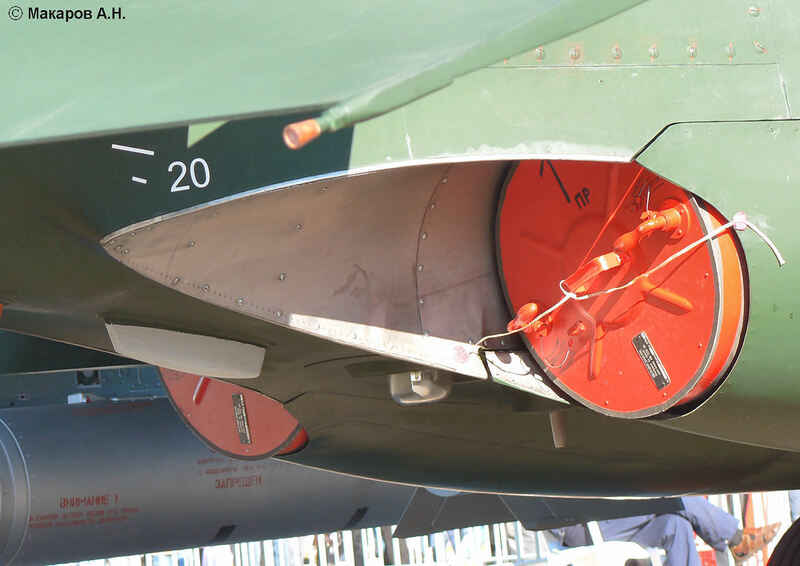 Lastly notice the white detonation cord which is embedded into the canopy. The clear parts are a good fit in the closed position. 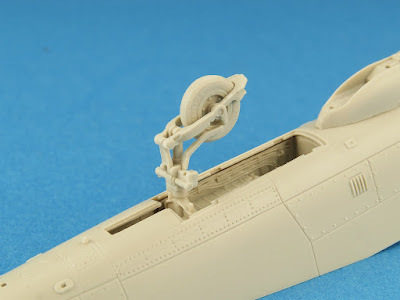 The parts a well moulded with not obvious blemishes and should give excellent view of the completed cockpit once fitted as seen here. 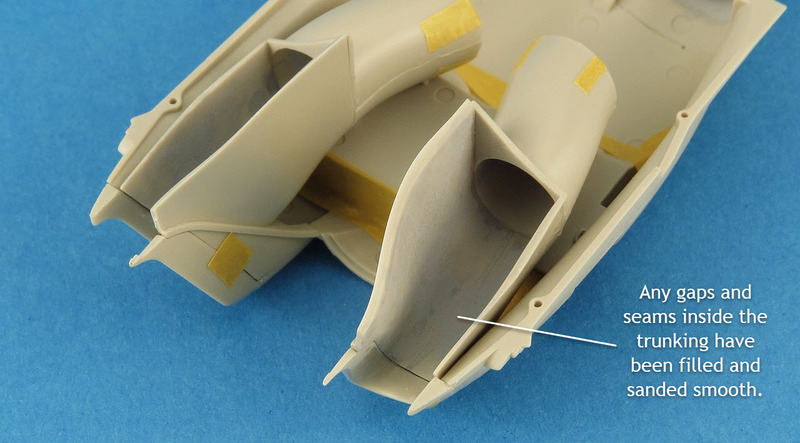 The tip of the nose is supplied as separate piece which from my dry fitting will need to some adjusting to avoid a step between it and the forward fuselage. 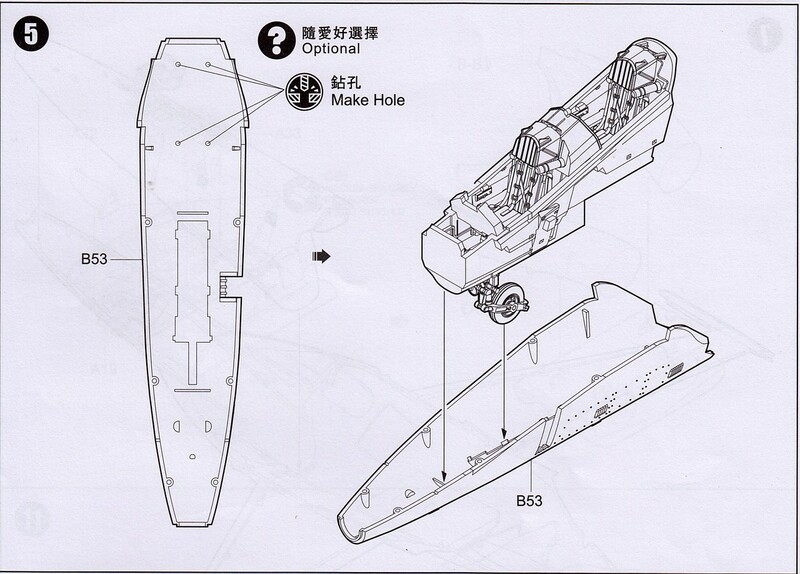 Also not again the panel lines and rivets that cross over the seam. 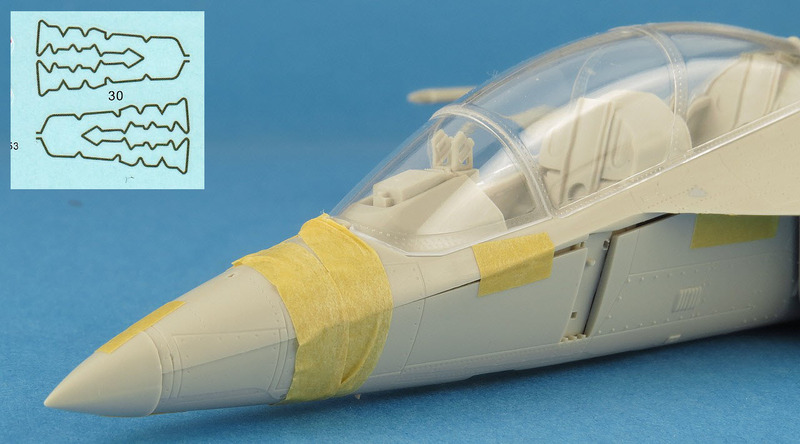 KH provides the det-cord as a decal to be applied to the canopy, however it seems to be a very dark grey rather than white as on the real aircraft (see previous picture). Like most model manufacturers (including Tamiya and Hasegawa), the only way to accurately mould a canopy with multiple compound curves is to do it with a seam. The seam will of course need to be sanded out and the canopy polished back to full clarity. 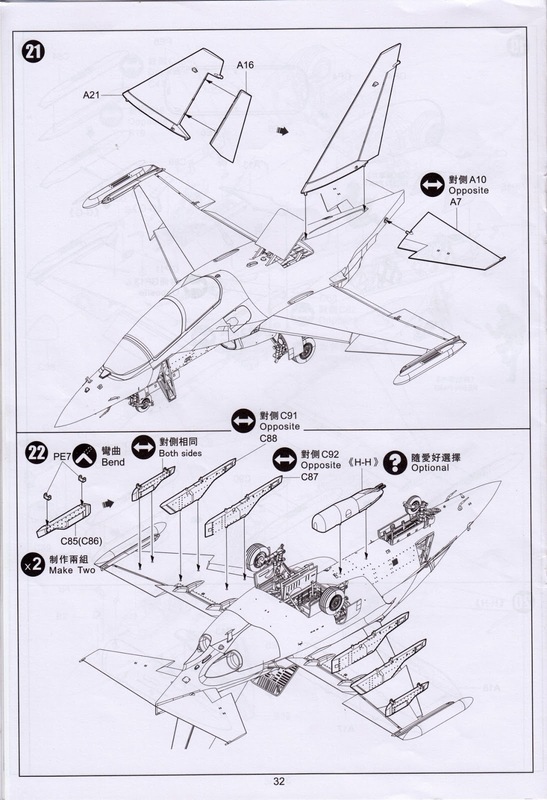 The very last step in the main airframe construction is to attach the vertical and horizontal tail sections. 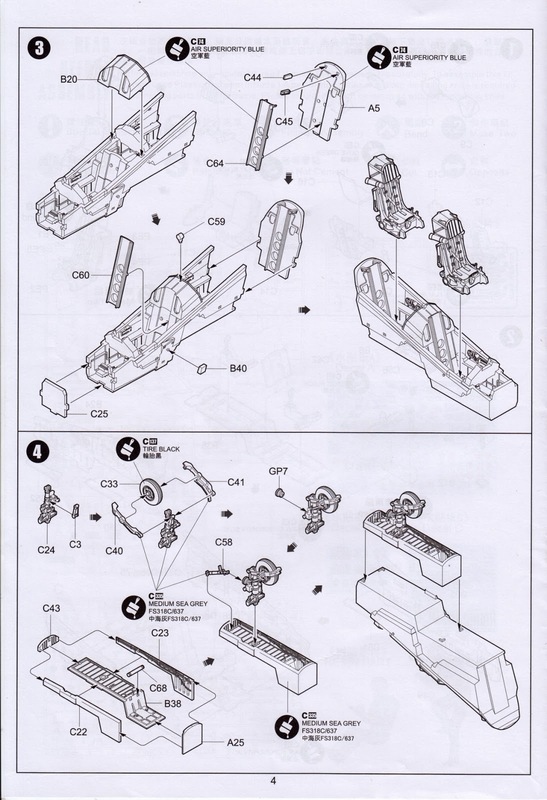 Nothing really to report here, the parts attached squarely and cleanly. 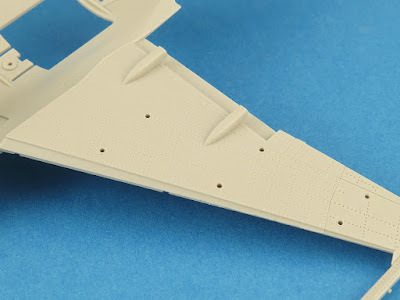 The vertical tail and rudder form a very solid and positive fit with the locating holes on the upper fuselage. 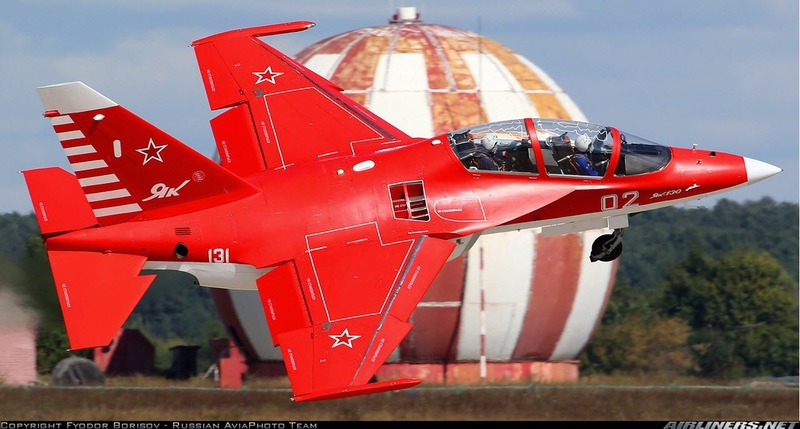 It's a big tail which helps give the Yak-130 a distinctive (attractive) look. 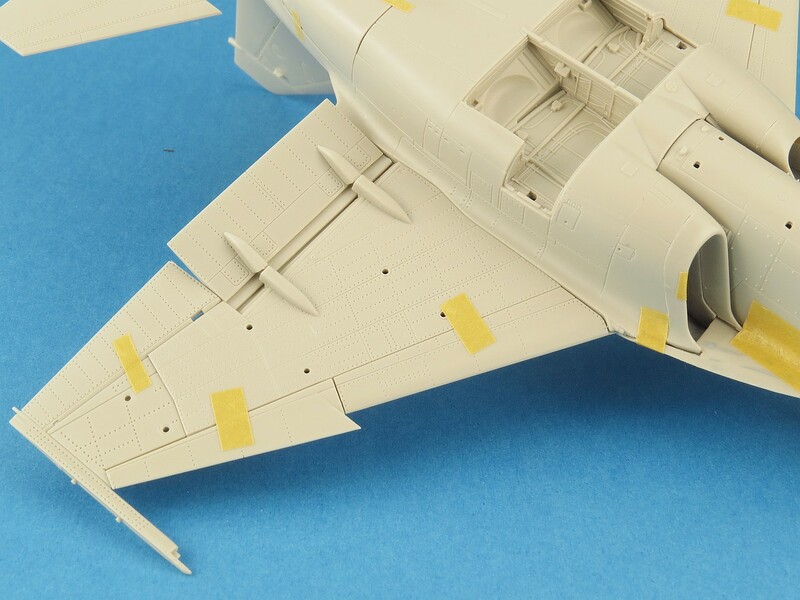 The panel line and rivet surface detail on the tail is some of the cleanest found on the model. A overall shot of the fully assembled empennage. I was a bit worried about the small attachment points for the horizontal tails, but once I inserted them the fit seemed solid and sturdy. If you plan to load-out your Mitten with weapons or tanks then you will need to install the pylons. From my testing the pylons sat nicely on the wing surface with the provided locating holes keeping everything properly aligned. It did occur to me that you would have to fill the holes if you planned to leave the pylons off. The completed wing showing off the pre-drilled locating holes for the pylons. 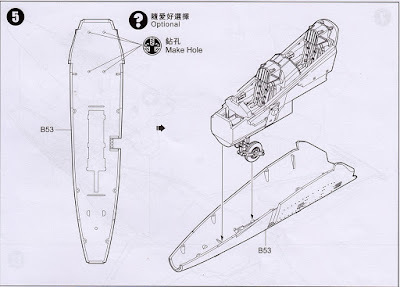 If you plan to build a "clean" model then you will have to fill and tidy up these holes. Kittyhawk have not been shy about adding in rivet detail on this kit. The completed main airframe construction is shown here mostly held together with Tamiya tape. 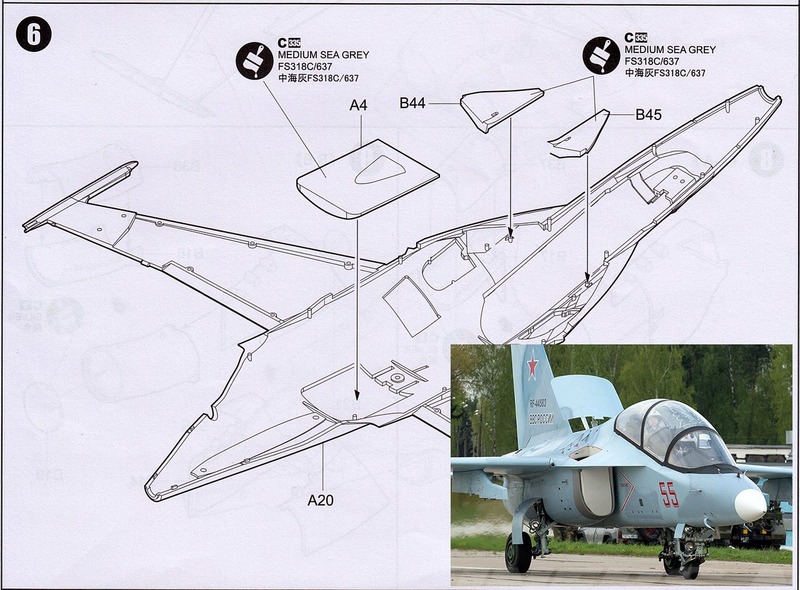 Whilst I have not compared it to drawings of the real aircraft, just from browsing lots of photos of the Yak-130 I would say it's pretty spot on. 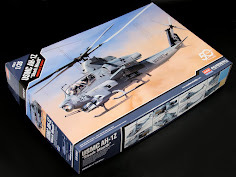 Overall, the way Kittyhawk has engineered this kit has impressed me. 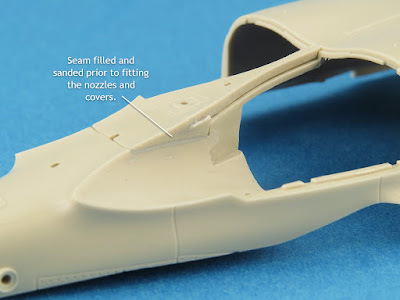 Sure there is seam-work that needs to be attended to but everything in the kit fits very well with no evidence of major gaps that the modeller has to deal with. 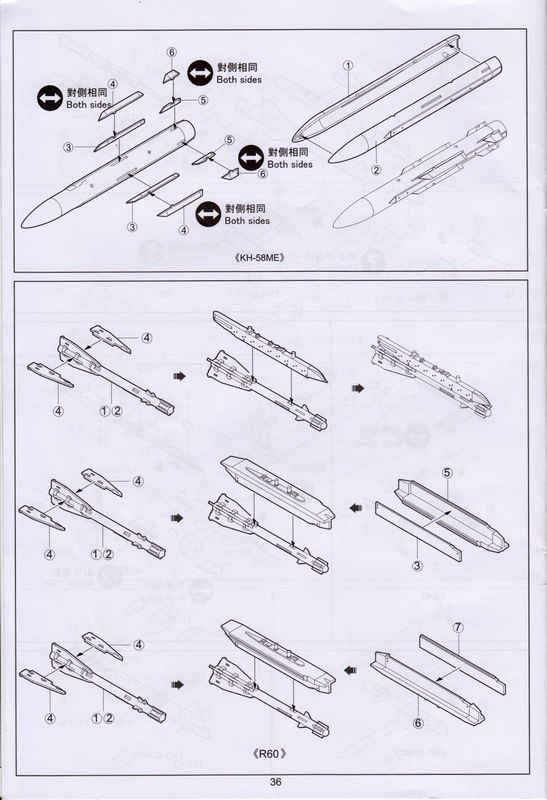 That is certainly not a claim that can be levelled at many previous Kittyhawk kits. I probably spent the most time on figuring out how best to deal with the intake trunking but even there I think KH has done a respectable job. 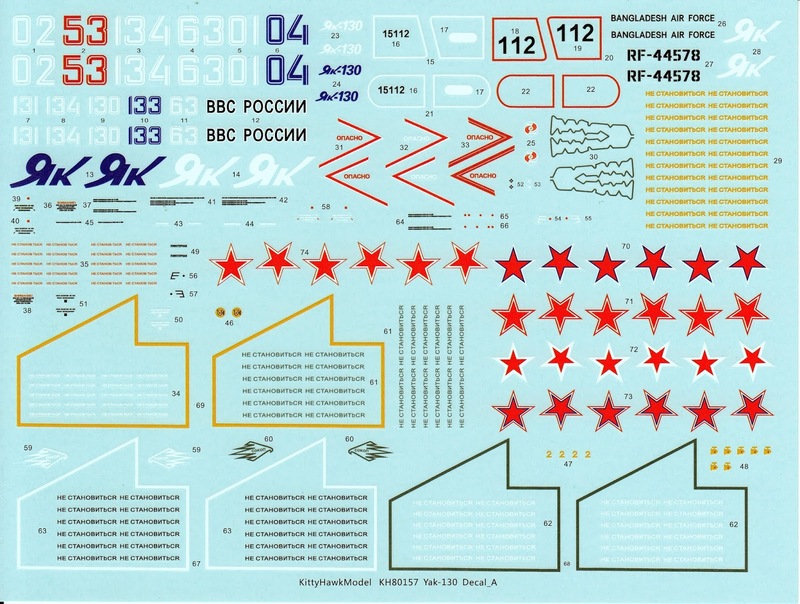 COLOURS & MARKINGS - KittyHawk 1:48 Yakovlev Yak-130 'Mitten' (KH80157)Kittyhawk provide a total of seven (7) marking options in the kit. 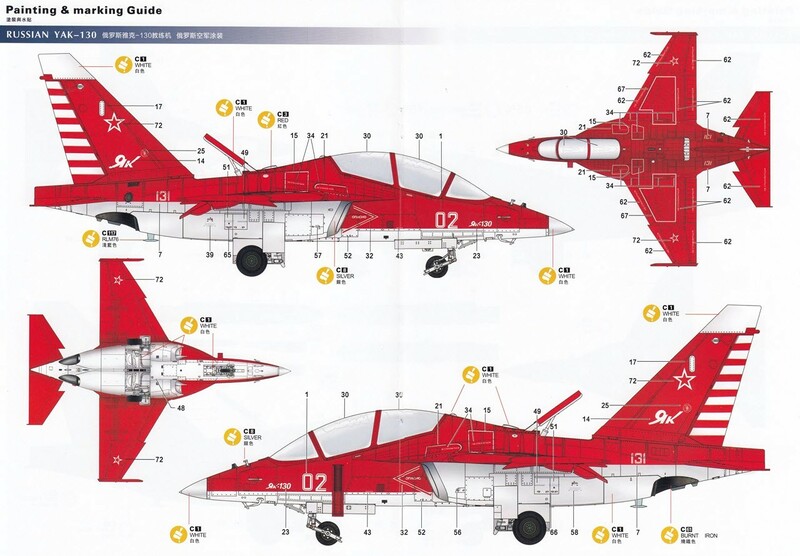 Six of the seven schemes are for Soviet operated aircraft including aerobatic teams, airshow display and demonstrator aircraft. 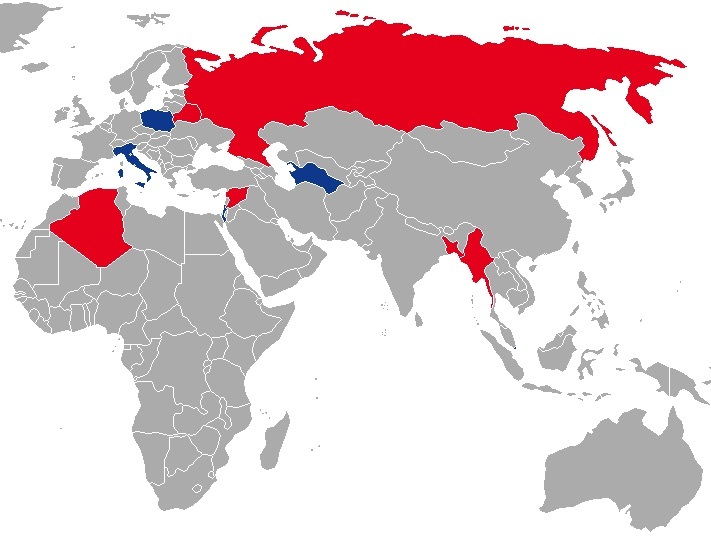 The only "foreign" operator included is Bangladesh which is a pity because the Algerian and Belorussian schemes are quite colourful. 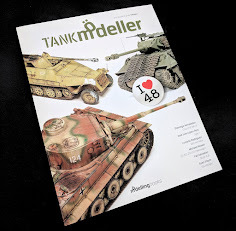 Each paint scheme is provided in a full colour glossy spread across two A4 pages (so nice and big). Colour call-outs are all using Gunze Mr Color paints, which although I like the range are possibly not the best source these days for accurate modern Russian colours. 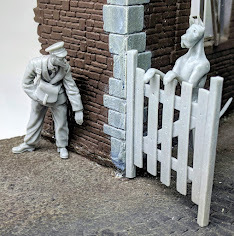 I'd encourage you to have a look at the paints coming from Mr Paint and Akan for deeply researched Soviet colours out of the bottle. 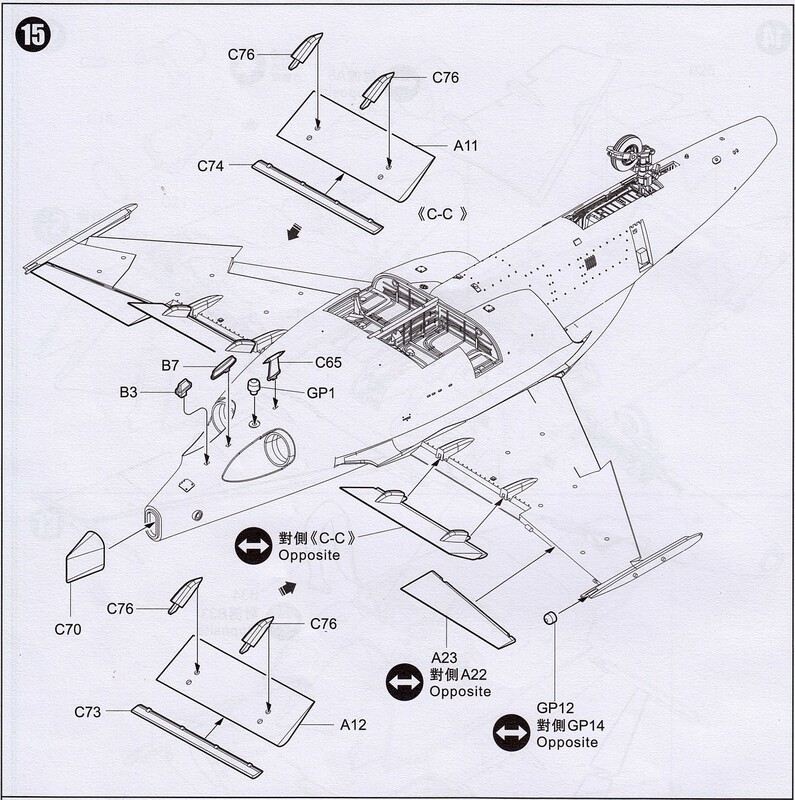 Early production-configuration acceptance aircraft. 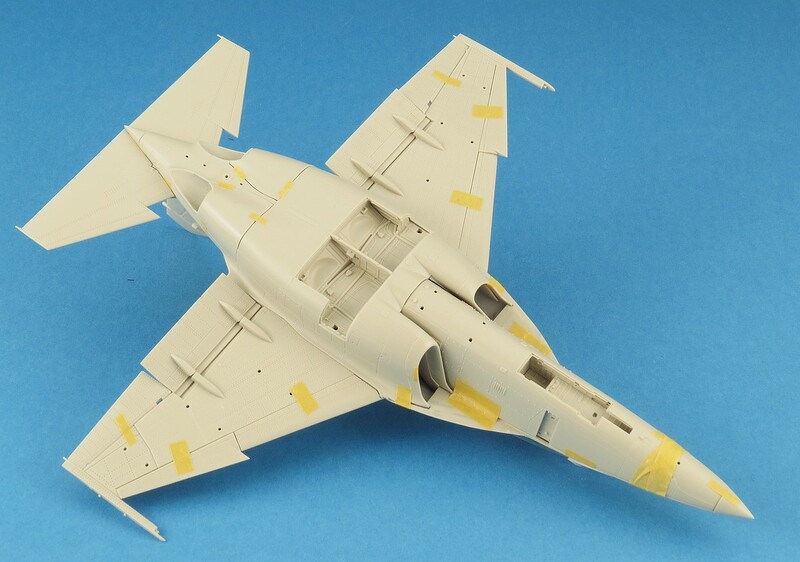 Photos of aircraft with this paint scheme all seem to have a test instrumentation probe fitted to the nose (which is not provided by KH). I suggest if you plan to use this scheme to do a bit more research on other possible differences. 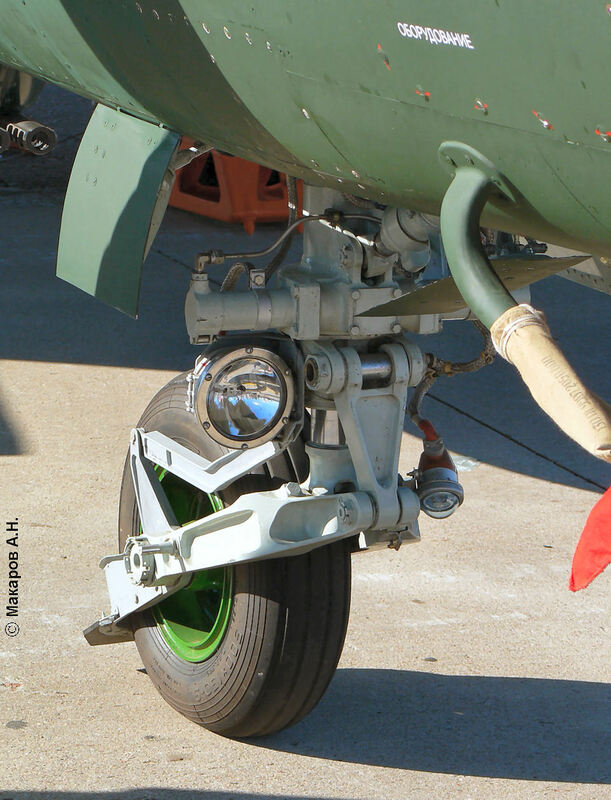 As seen at MAKS-15 airshow. 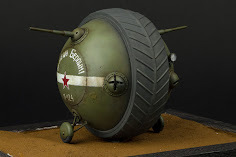 Special display scheme based on Soviet historical painting of Yakovlev Design Bureau. 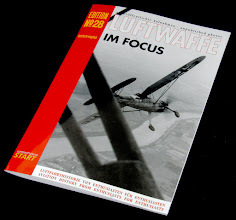 Aerobatic team "Wings of Taurida". Taurida - the informal name of the Crimean peninsula after its joining to Russia in 1783. 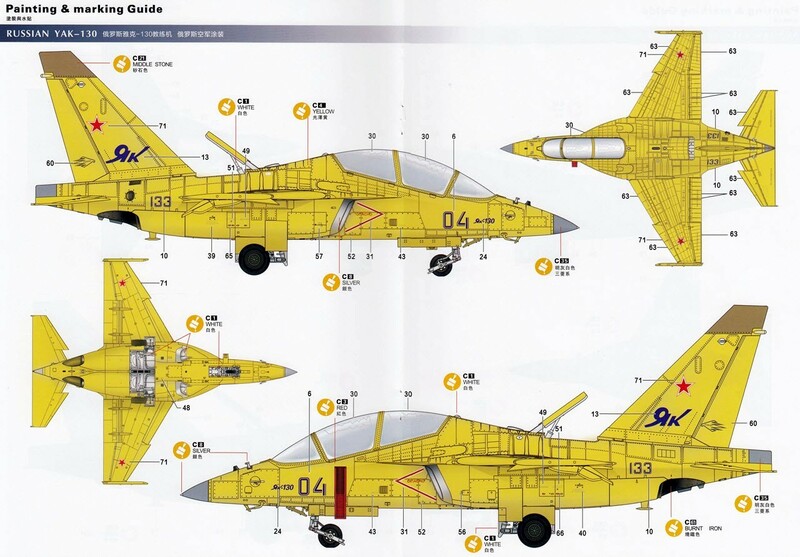 An interesting scheme in that distinctive "lemon yellow" soviet primer. I'd be very wary about using the KH colour call-outs here. This colour is very clearly NOT C4 Yellow. 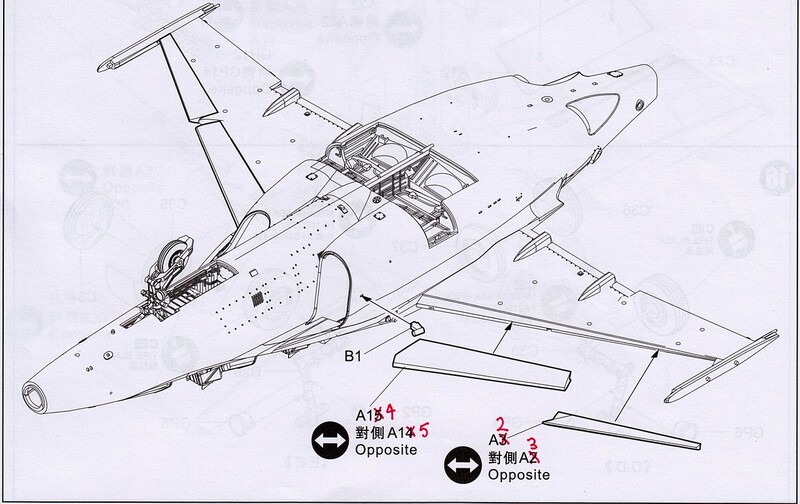 I would use instead something like MR Paint MRP-090 LEMON-GRAY. Much like previous KH releases, the kit decals seem to be well printed with no obvious registration issues. 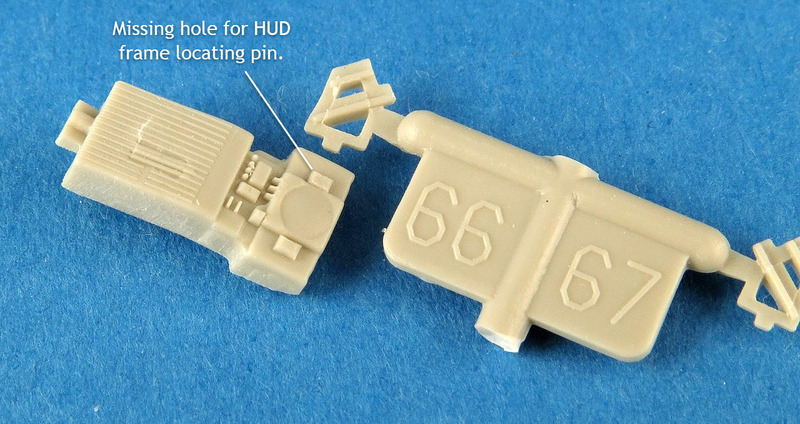 Though not as thin as you would expect from a set printed by say Cartograf or Microscale, I can confirm from previous KH builds, that the kit decals work well and respond as expected to setting & softening solutions. Some of the more colourful schemes have a lot of large and complex multi layer decals to be applied so bear that in mind when deciding on which option to go with. 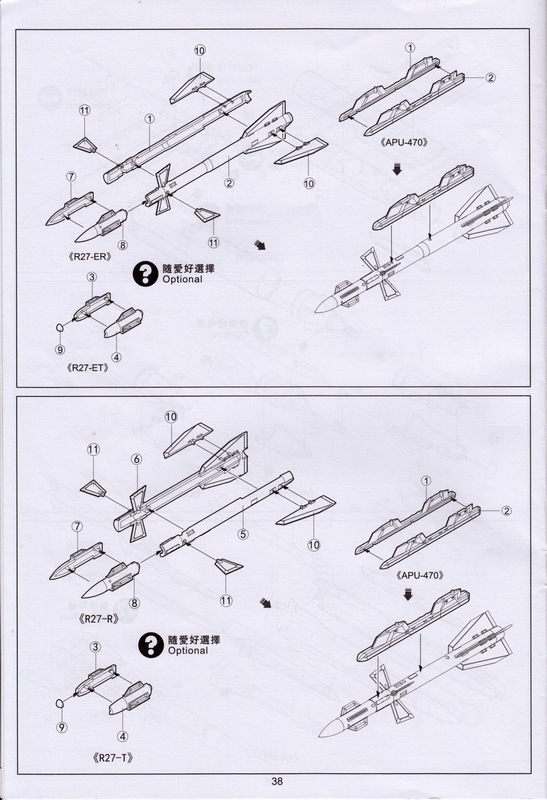 Two sheets are provided, one being from the aforementioned Soviet Weapons Set (KH80151) and the other specific to the Yak-130 kit. 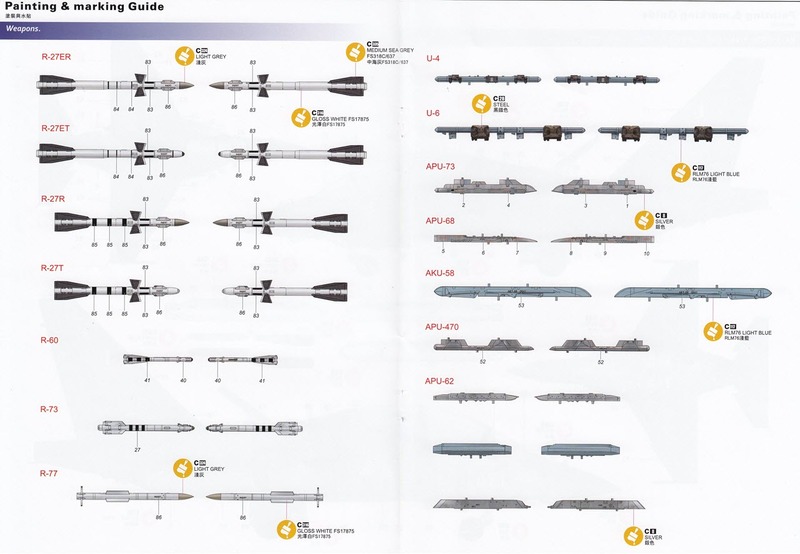 A third (much smaller sheet) contains the cockpit decals and some roundels. 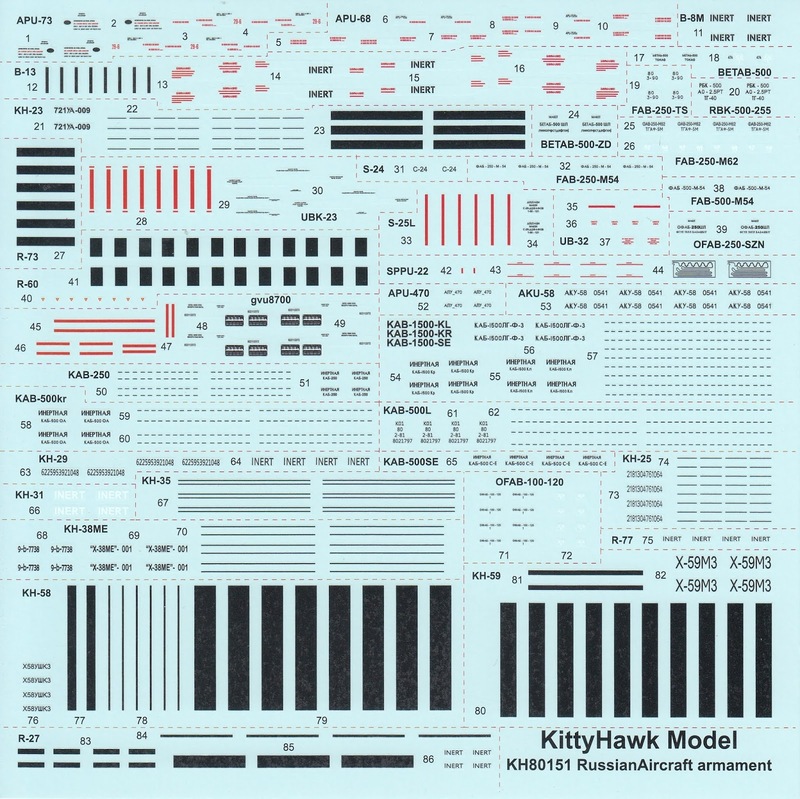 As I was working with this kit It occurred to me that Kittyhawk seems to have plateaued with regard to ongoing refinement of their kit manufacturing. 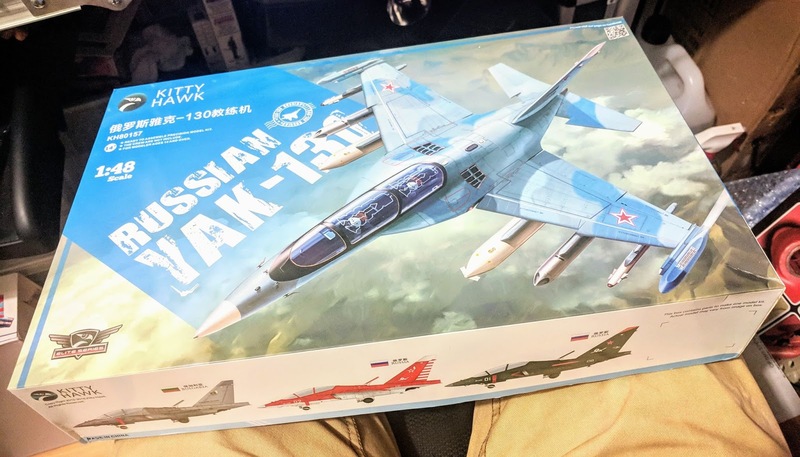 When I compare this kit with the last few releases (Su-22, Su-35 etc) it is pretty much on par. Not better, not worse, about the same. They've reached a point where they can turn out solid/credible kits. They certainly needed to improve from the early days, and they did, but now it just feels a bit like they are not pushing anymore, they are content. I'm not sure if this is a good or bad thing, its just an observation. Should they keep the status quo and keep turning out kits at their current standard ? 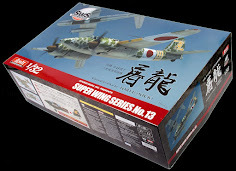 Well I know they have a very aggressive release schedule (just look at the list on their Facebook page) and trying to churn out new kits would not lend itself to putting time and money into continuous improvement but I'd like to see them continue to incrementally improve and by doing so take it up a step and produce kits that can sit alongside Hasegawa or GWH. Wouldn't that be something. This Yak-130 kit is very nice. 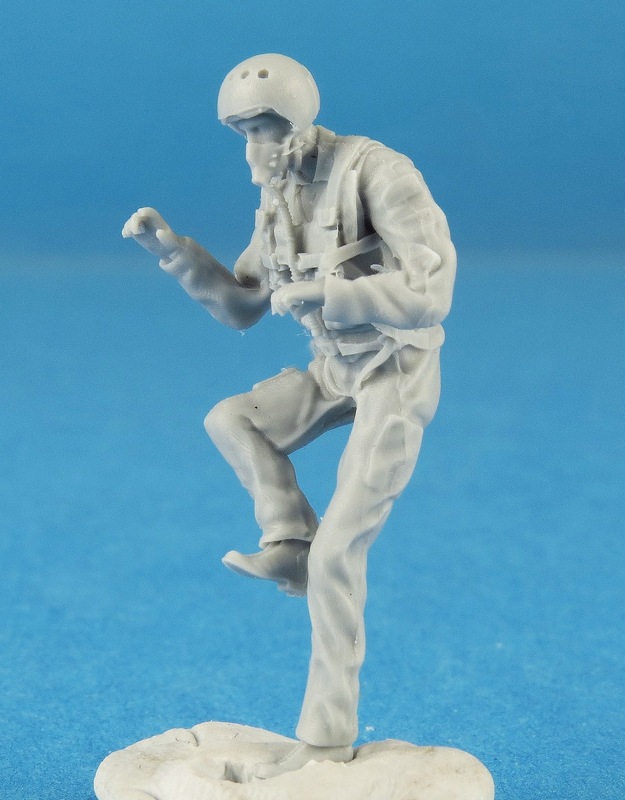 No major issues with construction or fit, the surface detail is good (if a bit soft), plenty of marking options, nice inclusions like the resin pilots and you can't fault the number of weapons provided. 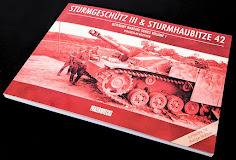 I even like the box art :) It's a very solid release and will build up into a nice model. As for continuing my build beyond this dry fit, well I am leaning towards that scheme with only primer applied. I've always thought that was something different and from the photos I could find, the Mitten got pretty grubby during testing/evaluation. Lets see where the spirits take me when I get back to it.